~ Less sea ice and warmer oceans are global warming symptoms joined at the hip. CLIMATE SCIENCE seems to be easy to criticize because almost anyone has an opinion about weather. But its far from a science for simpletons, even peer reviewed articles may be incorrect , this is quite rare, oppositely TV presentations rarely have it right, many individual blog opinions are so wrong it is not worth mentioning their names, then again many are simply brilliant and well informed. However, it is of great value when science is well reported. High accolades should be given when a news report is actually helpful in bringing out the complexity of the science, BBC sometimes gets things right, more often then not it is perhaps the best English language service about the subject. This nice well encapsulated video southwest England and Wales rainfall graph showed a strange behavior. A drought was occurring at a time when it should be wet followed by the "wettest summer in 100 years" when UK climate was suppose to be dryer. The year was apparently flipped around precipitation wise. The suggested jet stream being the culprit is a neat simplification. 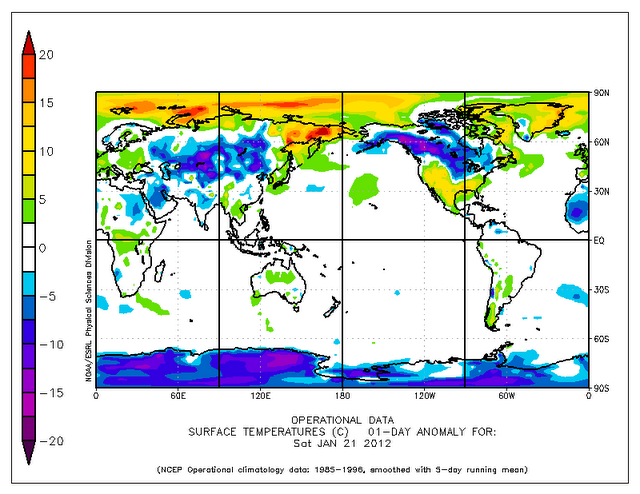 What really happened was a shift in the coldest air in the world position. Where Greenland was it during this summer past, while the Canadian Arctic Archipelago reigned coldest year round not so long ago. Lets look at distinct summers April to September while using 1980 vs 2012. The center of the summer cold temperature North Pole shifted from just North of the Canadian Arctic Archipelago in 1980 towards NW Europe in 2012 because Greenland is the only thing cold especially minus multi-year ice spanning the entire Arctic ocean. The mean Temperature at 600 mb is very close to the temperature of the entire troposphere. Next to where its coldest (roughly between blue and green) you will likely find the Polar jet stream, here the jet stream potential position moved closer towards the British Isles, as opposed to further North closer to Greenland in 1980. The jet stream shift can also be seen by variations in sea level pressure, while during near drought conditions UK had higher pressure during the early part of the year, not so for the remainder. The jet stream hung out over the UK exactly at the threshold between low and high pressure. A low pressure system next to a much warmer high may mimic the effect of warm air adjoining cold denser air making the Polar jet stream. The natural colder air surrounding Greenland gives a drop in pressure height compared to immediately to the South. On top in between the two air masses is the jet stream. 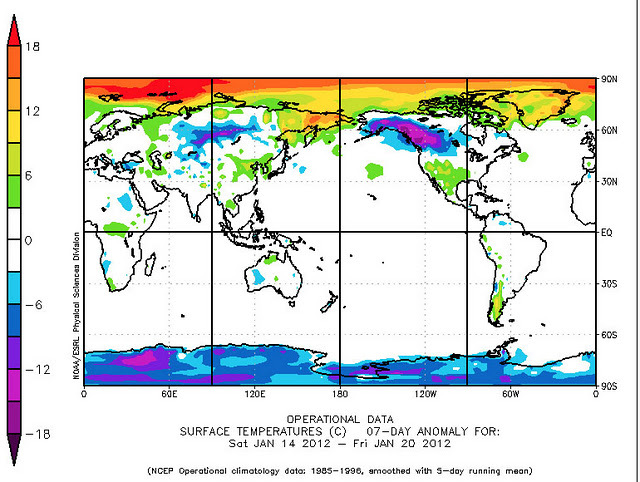 Once upon a time Greenland was not the coldest place during summer. The air above it being at high altitude was not as significant as the cold denser air above the Arctic Ocean with much thicker ice. As a result the jet stream pattern was affected over a larger distance, now the pattern is broken and morphs around Greenland which remains the only place with coldest air during the summer. This directs gulf stream water vapor rich air to hit the UK and Ireland just like it always was every winter. April to September 2012 upper winds (left) were very unlike those in 1980 (right). 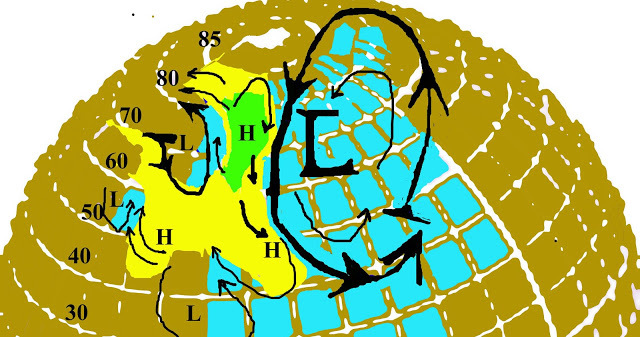 They were much stronger for NW Europe during summer of 2012, bent towards the NE suggests the proximity of a constant source of cold air parking the jet stream near a location offering a cold to warm air mass contrast (Greenland). 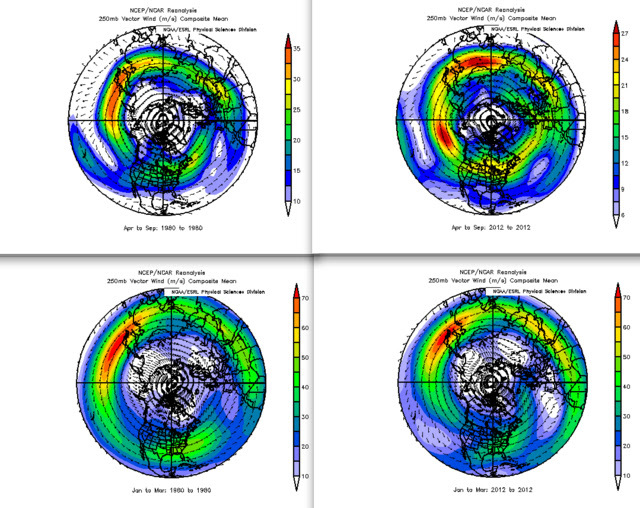 A circumpolar look reveals a net migration of the jet stream pattern towards the North and Greenland. Either during summer (top) or in winter (below). The lesser the extent of sea ice the greater the compression of winter around the North Pole as well. There may be other factors giving more rain, sea surface temperatures being one of them, record low Arctic Ocean sea ice volume is part and parcel of Global Warming along with warmer sst's. But there is no question about weather systems, if a location lies in a path fueled by the gulf stream there will be more rain there. If the sole source of summer cold air is a huge glacier, the jet stream should not be inclined to move very much. It is also quite astounding that there was a drought when the UK has recorded its wettest year ever. This means broken or new weather patterns adjusting to massive baroclinic changes in the Arctic channeling moist warmer Atlantic atmosphere to new directions. ~Weather Underground's Lee Grenci neat summary of Arctic air masses needs greater micro details. A World of Weather: Fundamentals of Meteorology. Mr Lee's standard description of Arctic air mass requires a complementary add on given recent times of much thinner sea ice, which increases radiative cooling during the long night, as a result it is significantly warmer in the Arctic. The Continental Arctic description above could have easily been extended over the Entire Arctic Ocean when sea ice Maxima was greater year round some 20 years ago, when multi-year ice was much thicker and expansive than it is today. So the map terms used in fundamental meteorology are coincidentally appropriate, more fitting to these days. However the coldest air in the past was certainly over Northern Ellesmere and Greenland consistently over a large period of the year , so the map even if used in the past is a simplification, not really applicable for those who live in the Arctic, but quite acceptable from the perspective of a Southerner. Arctic dwellers respected cold bitter winds from the North then, not so much during the last few years of greater warming. Today most of the Western Arctic Ocean 850 mb temperatures vary between -20 to -30 C, the sea ice simulates land. However surface temperatures from some buoys don't show steep inversions, its cold but it use to be much colder. the famous summer of March 2011 when some areas of the Northern contiguous US temperatures reached +30 C. Continental Arctic air must not only contend to cool the South but the North. When the Arctic warms further March in Minnesota at +30 will be even more common. 1- Slow start of winter; Winter does not start at the solstice as tradition goes, it begins at various days about the fall equinox, when darkness hits the North Pole. ->This year winter started very late. 2- Sea ice thickness affects the enter circulation of cyclones about the Northern Hemisphere, very little thickness means the slow build up of winter. -> Low pressure cyclones will easily penetrate the North Pole area same as last year, this means a warmer Arctic and somewhat cooler temperate zone, as opposed to a wide variation of very cold to cool temperate winter. ->Implying great moisture events throughout the winter everywhere influenced by sea evaporation. -> means not steady monotonous weather for the Northern Hemisphere. -> Wait until ENSO trend seems to be quantified. 2- while waiting for the fog of ENSO to clear, is best monitor world wide snow extent, Arctic sea ice volume and the general appearance and location of the Jet stream. -> all these will define the winter to come. Give it about a month to be formal. But I give A Tentative projection: A warm wet winter for all. How warm depends on cloud extent, how wet depends on whether El-Nino will survive. And by wet, I mean when near 0 C with snowfall as well. Ireland and UK should have a reprieve in regular rainfall and more variable weather, North America will wonder where winter went again. The rest of The NH will enjoy warmer weather along with bitterly cold periods as Eurasia will cool down more than the Arctic. It was very much so late, no correction or more intelligence can be added. Even with a high pressure usually cooling the air all the way to space, Arctic ice buoy temperatures are warmer than over land or Greenland. The buildup from the South will give unique weather , again similar to 2011-2012 winter. The UK being hit hardest will get a break (like Winter 2011-2012), but will see rain return in spring, the winter split personality favors a drier NW europe, the cold temperature north poles become distant from Greenland changing the position of the jet stream. Russia use to snow got it bad where a lot of its people live, this is not a sign of a cold winter, although snow cools surface air quickest, it is a dominant circulation pattern favoring wet atmosphere to reach further Eurasian inland from the Atlantic . Consequences of Kara and Barents sea being open. North America's west coast usually should get hit hardest by rain but for a stronger winter Eastwards. Since that is not the case whatever moisture is garnished by a weaker lower sun over the Pacific can't make up for the drought conditions in the Interior US, even if rain gets spread out more evenly. Moisture by snow accumulation is always good for spring, recent wetter winters can't match the benefits of a spring snow melt. The great summer of March 2012 should repeat again, not necessarily in March , but the winter for North America will again not be impressive except for Atlantic in origin moisture events, snow or rain. The Polar jet stream has and will be extremely erratic, bringing a milder cold from the North, garnished by a weaker winter build up in darkness, and a much warmer advections from the South. Because snow on the ground will be less spread out, the albedo effect of same sunshine over darker ground will welcome South in origin winds having a much stronger impact. Averaging the entire cold season to be like fall weather all winter long. > Wait until ENSO trend seems to be quantified. One month did not resolve that issue, ENSO is a large player because it affects the overall presence of clouds, not only temperature, clouds affect weather patterns. 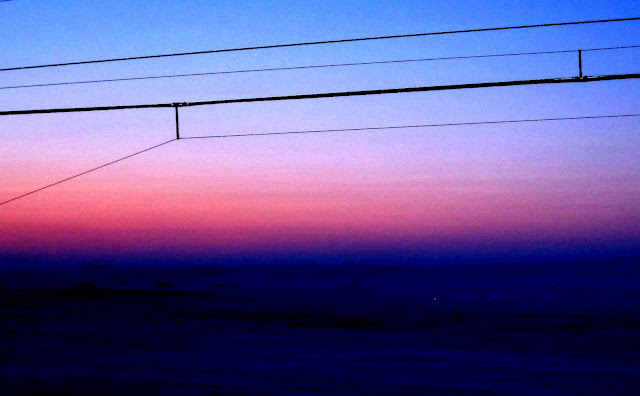 High Arctic horizon CCN observations varied wildly. 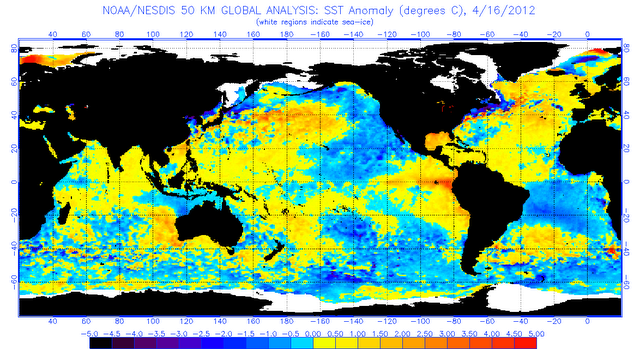 Likely an indication of Neutral ENSO at a time when El-Nino should fade. But comes spring is when El-Nino should quick start back somewhat staggeringly. The descent from a moderate stance was not spectacular and much reminded of another cycle not long ago. The mechanics are that El-Nino gets initiated by weak warm Northern Hemisphere winters, with the opposite a strong and cold (windy) Southern hemisphere winter ravages the prospects of a strong El-Nino, just as recently occurred. Removing ENSO implications makes thinner Arctic sea ice a more prominent winter influence. While waiting for the fog of ENSO to clear, is best monitor world wide snow extent, Arctic sea ice volume and the general appearance and location of the Jet stream. -> all these will define the winter to come. A warm wet winter for all. How warm depends on cloud extent, how wet depends on whether El-Nino will survive. And by wet, I mean when near 0 C with snowfall as well. Ireland and UK should have a reprieve in regular rainfall and more variable weather, North America will wonder where winter went again. The rest of The NH will enjoy warmer weather along with bitterly cold periods as Eurasia will cool down more than the Arctic. Well written, no need to change it, the nature of High Arctic upper air profiles since was massively leaning adiabatic, Hudson Bay will freeze up quickly by rapid heat exchange, but remaining seas slower because they are more surrounded by seas than land. Overall winter is hardly building up steadily over a vast period of time or land. It struggles in spurts always demolished by a cyclone bringing warmth. Intense cold buildups will be in cells detached from each other. With none of the past massive winter onslaughts, organizing winter will be scattered, influenced once again from the South having its heat encroaching over new winter territories. This leaves El-Nino in a lynch , suspended animation, but nonetheless leaning on a come back summer 2013, because there is no mechanics in place fostering a deep La-Nina except for the Southern Hemisphere dominated by Antarctica and ozone holes, this was a surprise to me, but so. Climate departure from normal is at the Poles, one in the Polar South more or less the same, warming much slower than in the Arctic, while the Arctic changing fast bringing all Northern Hemisphere weather patterns to morph like its always autumn or spring. If La-Nina returns full blast, unlikely but if so, the melt in spring and summer time will crush 2012 great melt as a distant old record, the Pole will be sailable. If everything remains Neutral or warmer ENSO wise, the ice pack North Pole will be assailed once again by open sea water, 2012 record melt will be still exceeded. The big add on would be increased tornadoes (where they thrive) early in the season, its in the cards, a normal tornado season is not yet foreseen, by all accounts waiting for Polar stratospheric vortex to show itself last. wd December 2, 2012.
b) "The rest of The NH will enjoy warmer weather along with bitterly cold periods as Eurasia will cool down more than the Arctic." So far so good, this was largely foreseen. 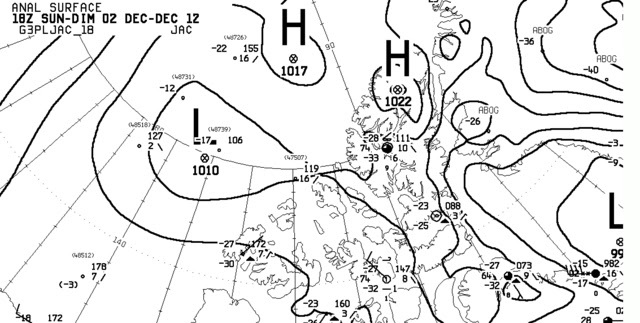 Persisting open water over Kara, Barents and Greenland seas brought about a large steady low pressure zone onto it. Further to its South a similar steady high pressure area, larger, dryer and much colder is hanging about. 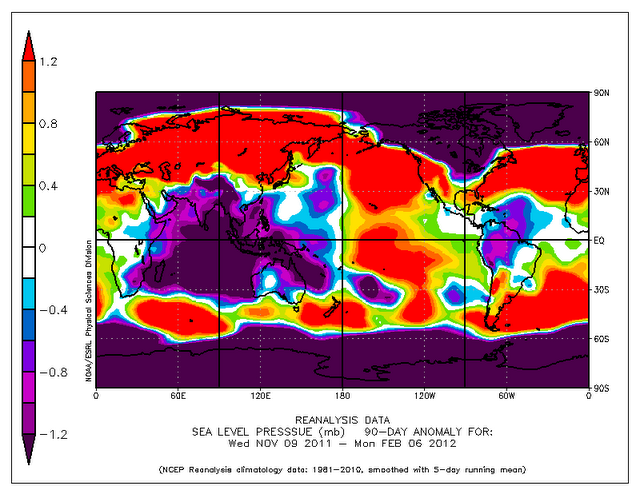 There seems to be a temperature correlation between open sea water and the presence of Low pressures above it. If the general difference is 30 degrees C or so between adjoining regional air and open water sst's the Lows stager over the open water. This Central Russian High combined with the general circulation from the Atlantic gulf stream gives significantly warmer weather like in Germany with Christmas good enough for swimming. ~ The end result is different weather further South. Not necessarily warmer or pleasant. 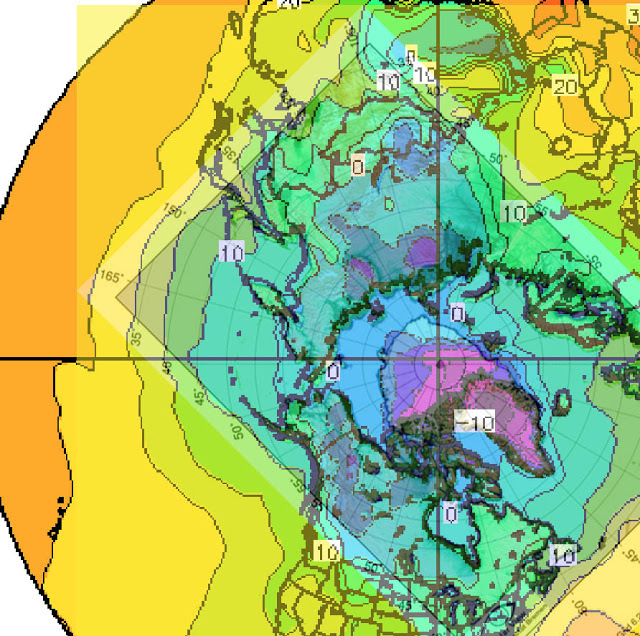 Removing Geography highlights the pressure configuration around the North Pole. 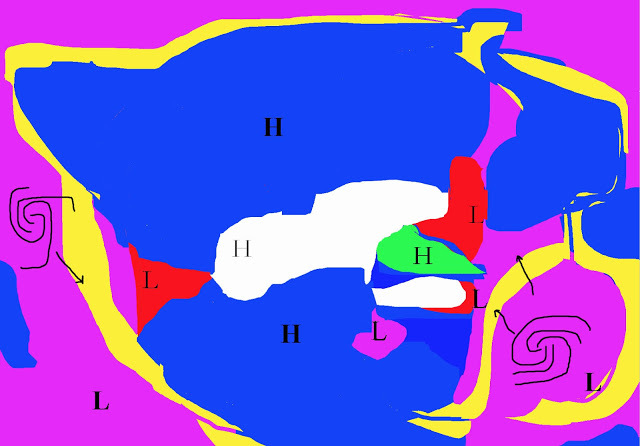 White zone is sea ice (natural anticyclone country), Red is near sea ice open water, Blue is high pressure zones, Green is Greenland, Yellow is the jet stream and in purple Low pressure dominated zones. For a long time Greenland High (In Green) balanced the Cyclones on each of its longitude sides. Low's heading towards Baffin Bay usually died there. While South East Greenland Lows intensify Eastwards. The life time of the Baffin Lows were always short lasting, always to be replaced by another one. 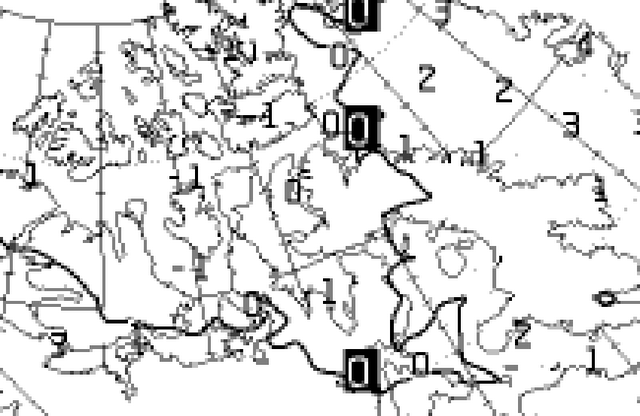 On the East side of Greenland the Lows intensify and die much further away. The end result is a fleeting variable High pressure on top of Greenland., blocking Highs over the North Atlantic happened but only relative in strength and steadiness to the Cyclones surrounding Greenland. There is no huge ice Glacier near Bering Strait and on the Northeast Pacific coast, but a similar death of Cyclones happen next to Alaska, rich with Glaciers. From snow fall and also the lowering weak in heat Arctic sun, the build up of winter was evident by High pressure permeating the continents of Eurasia and North America. 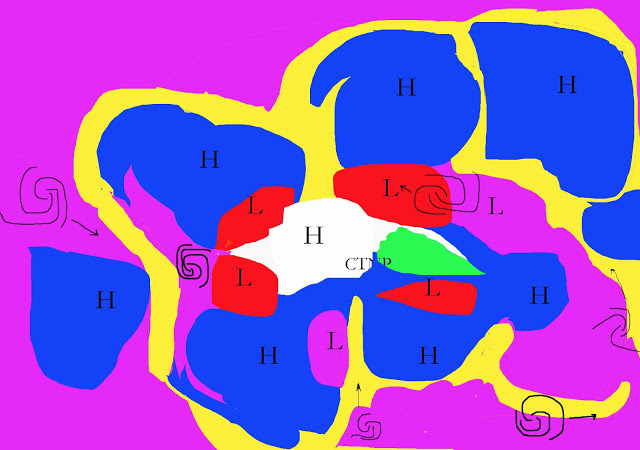 The 2 largest Blue areas form the Polar cell, to its South is Polar Jet stream. Roughly prior to 1997, Arctic pack ice was present everywhere even during summer, Arctic summers had snow storms, after 1997 and ever since the large El-Nino event of 98, there were lightning rain showers near Davis Strait (South Baffin Bay) in February in the middle of Arctic winter at least once. Along with these showers was the open water, this is key for Cyclonic activity. A jet streamed propelled Cyclone from either the North Pacific or North Atlantic died quickly over thick multi-year ice. The opposite was rather more favourable in pure darkness, the expansion of winter in October was not unusual, sounds colder but not for every regions in the Northern Hemisphere. Early arrival of winter for some turns out to be very good for others, its colder for the East coast of the US but warmer for NW Europe. The turn of seasons in turn ensured NW Europe heat directed by system cyclones influenced by the Gulf and jet streams. This is the pattern which usually prevailed. There was always variations, but this was the prevailing pattern for a long geological period, it is the pattern which shaped humanities Northern Hemispheres recent history. There was 4 main melt areas, Baffin Bay , Greenland -Barents and Kara seas, Laptev and East Siberian seas, and finally Beaufort. All these seas had persistent Lows more or less glued to them. The natural physics of this doubling of wide open seas previously with ice is obvious, the greater formation of winter gets fractured, the polar cells split and become weaker, way above the jet stream follows the pattern, but less uniquely funneled, becoming multiple individual streams inherently weaker. At this point Hudson Bay becomes prominent, it was always a sea area with Natural Low pressure hanging above conversely like Greenland with a steady High pressure on its top. However, this natural through leads the Jet stream to take a Northwards path. Anything below a stream follow its direction, including hurricanes. The immediate apparent change is the new positions of Cyclones and High pressure systems. 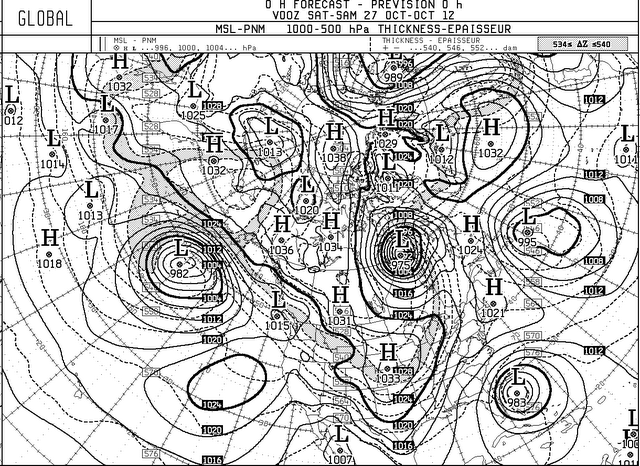 What is even more ominous is the High pressure blocks, in the case of near Greenland, created by Lows surrounding it. Cyclones surrounding Greenland are not new, but very slow moving or continuously renewed ones fueled by wider open sea water is. Open water kept Cyclones recharged with its energy, immediately balanced by counter action from higher pressure zones. 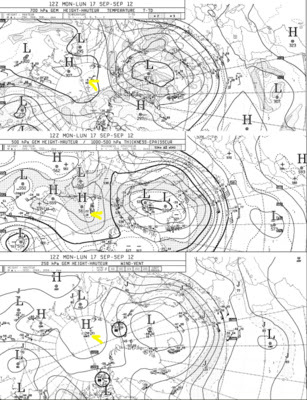 As a result, Anticyclones persisted where they should not be, over the lower North Atlantic, where they can cut off heat from going to NW Europe, as was in December 2010. The nearly perineal Natural Greenland High surrounded by Lows got bigger and amplified in strength. But the Lows on the East side were all together wide and very expansive. Separated by incredible winds, Icelandic Low collided with East Greenland Higher pressure which drove this usually immobile Anticyclone to stretch Southwards, even over North Atlantic sea water. Late October low elevation sun was not enough to compensate for High pressure forming over ocean water, having its own feedback mechanism causing cold clear air, ideal for radiation escaping to space. By collusion of strong systems fueled by newly available added sea energy the High expanded mainly Southwards. Elsewhere in the Arctic was similar. The circulation pattern finds itself transformed, uniquely shaped by the low sun at the dawn of the long winter night. Warming of the Arctic caused a cooling over a wider area South. longitude shrinks with latitude, so average temperature measurements of a warmer Arctic gets muddled by the lower latitude greater area geography. The entire temperature trend of the Northern Hemisphere may appear confused, more stable, while its in fact its much warmer. Make no mistake, it is a warmer world even though you may feel colder the heat is where there are few people. The current combined Low pressure systems over Greenland, Barents and Kara open water seas dwarf Greenland, but are responsible for the High pressure blocks, air coming down from on top Greenland is dry, ideal for clear skies, great to enlarge the High almost always present over the 2nd biggest ice sheet on Earth. The biggest reason of this occurrence is the lack of sea ice combined with the low sun along warm Lows coming ftom the Southwest Atlantic mixed with a "stall" of systems not quite moving in the Arctic. ~ High pressure Anticyclones permeate the lower Arctic and higher latitude temperate zones. ~ At their core are pervasive Low pressures over Arctic ocean open water. From there the tropical hurricane meets the pressure wall created from the new face of deep blue Arctic Ocean so late in October. 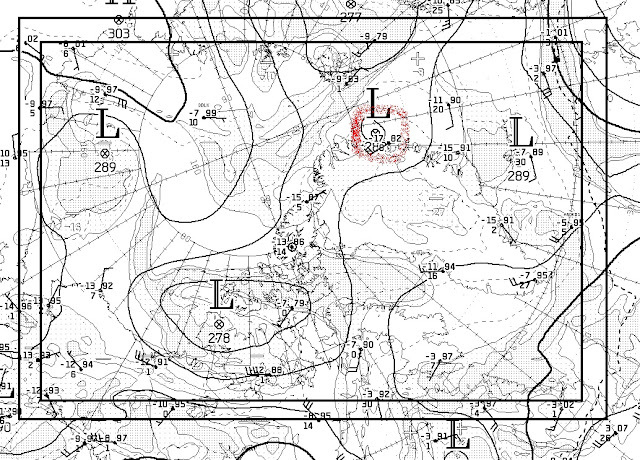 1038 Mb High right at the North Pole, at sea ice central. Surrounded by Cyclones some with pressure as high as a normal Anticyclone would have at his centre. The pressure stabilization endless war is reaching extremes. Beaufort, Chukchi, Kara, Barents, Greenland and Baffin Bay all have Low pressures above their warmer open water. It is no coincidence. The immediate pressure counter action are Highs making a wall of high pressure from: Bering to Alaska, NWT, Labrador and North Atlantic only pierced by a Low pressure over Hudson Bay strictly driven quickly Northwards to rapid extinction by the Jet Stream . From afar the glitter says ice. The mirror in the Bay can't be mistaken otherwise. But stepping on it revealed water with a micro layer of grey ice so thin any wind would break it. The average temperature 24 hours preceding this picture was -11 C. It's -16 C at the snapshot. Winds totally calm. Temperatures have not been above 0 for a month. Yet I can step right through where the ice should form quickest, near the shallow shore, the sun is about to set but is very bright, an effect from the cleanest air in the world next to Antarctica. With Sea water at -1.7 C, Ice freezes barely. That is the signature event of the last few years. Ice starts to freeze at -11C, but this time only with optimal conditions. Of notice the snow clusters still at bottom, not frozen .. Most of its extensive cover was blown away from the Bay, some of it probably sank in deeper water from covering a huge area while slightly being submerged under the wider sea. There is no doubt that the much wider snow cover helped stabilize the waves. In effect helping with the very slow refreeze. Unlike snow covering just under the sea surface, Grey ice floats right on top. The next day Arctic cod , Qanayuq, finally enjoy the safety of new ice right near shore, finally set after a month and a half of below 0 C weather. 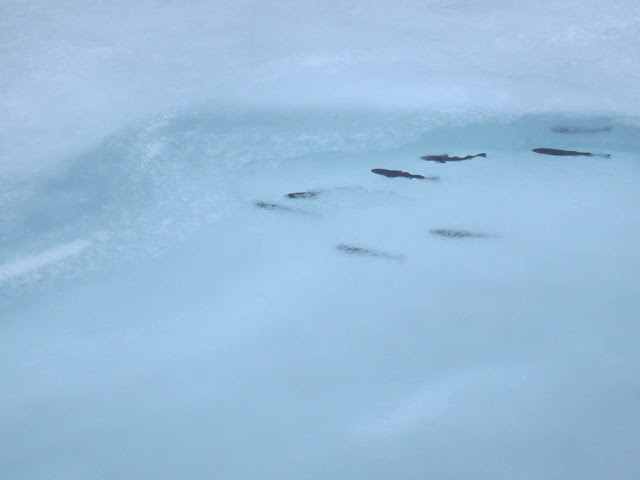 Qanayuq were harassed and eaten by beluga and narwhals in ice free waters for months. It looked like a celebration swim for them, they can hide and escape easier. 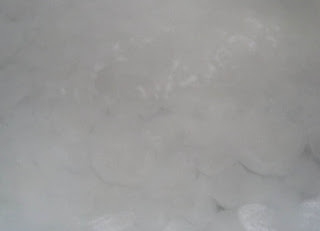 5 cm ice was made for the first time, the last 24 hour average temperature was -13.9 C.
Lebedev's formula gives 5.3 cm. It works only with very ideal conditions. There was no winds, the sky was clear for about 4 hours, sea waves were non existent. But for nearly a month and a half practically no sea ice was created. Freshly formed sea ice, quite unlike slightly submerged snow. Penetrable not so easily even by a curious seal. The upper air profiles have almost exactly change in nature with the onset of this sea ice. From adiabatic profiles with maxima temperature on the surface, to a profile with inversion peaking at a temperature maxima several hundred meters above. This is not a coincidence. Sea ice exists with atmospheric boundary layers which vary in height and strength depending on several factors. Thin ice usually does not create steep inversions. This is observable by looking for refraction effects. If a snow flake falls on the ground it either melts or remains to gather with countless others on the frozen surface. If a snow flake falls on a lake, it melts unless ice covers it. 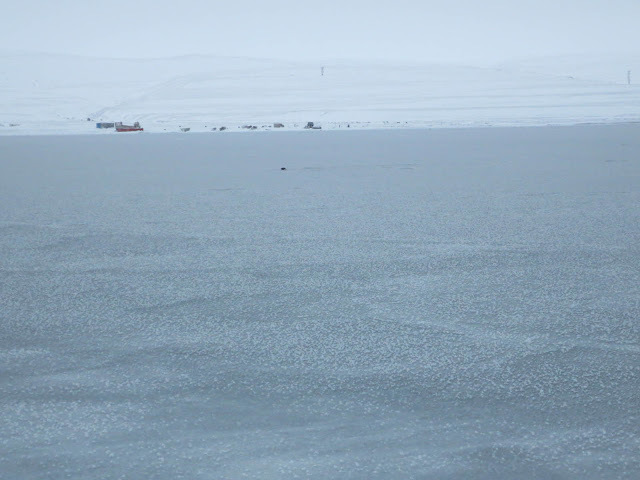 Moderate snow showers on open sea water at -1.5 C floats to gather in clusters which sink just below. 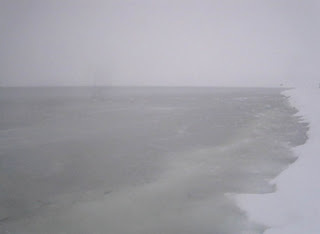 Moderate snow showers, while temperatures of -6 C, gave an illusion of ice completely covering the Bay. It wasn't so. It was more like slush. Snow flakes gathered in clusters all the way to on top of sea level. Somehow clusters weighed heavier than sea water and sank. All the while no ice was formed. Not to confuse with grey ice. A closer look of the snow nodules (right). Lower right are surfaced snowflakes, the nodules appear greenish because they are submerged for the most part. On the other hand, Grey ice floats like ice. This is the main difference. When grey ice forms some ice is also present, none here, just wet snow which doesn't melt. The next day a slight Northern wind pushes the slush cover away, even at -6 C surface temperature, while sea water remains not frozen at -1.5 C, but cool enough for snowfall to remain more or less intact. Another close up reveals the not wind swept near shore snow nodules, some sunken to the bottom. A cloud clearing reveals brighter colors of submerged snow clusters. Unlike grey ice, there is no floating ice present. Stepping in it gives the impression of very elastic slush not wrapping my boot but repulsed by it. There was also a lot of small air bubbles. The remote sensing look of the past days likely displayed snow shower accumulation in green. Last day or so this green turned back to blue, to open water (Oct 15,2012). The satellites interpreted this snow as ice. 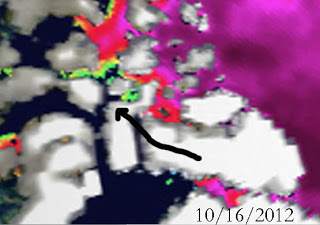 Although not the same, the way to recognize snow sea cover is that it is unstable, fleeting and very sensitive to winds. 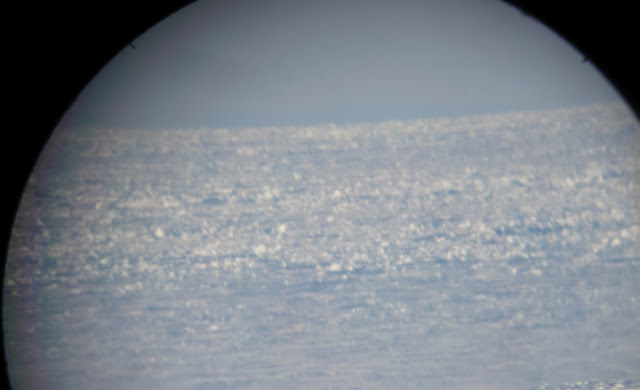 Surprisingly, atmospheric refraction properties of extensive snow covering the cold sea was similar to thin ice. Even to the point of creating inversions, long delayed by extreme warm weather. 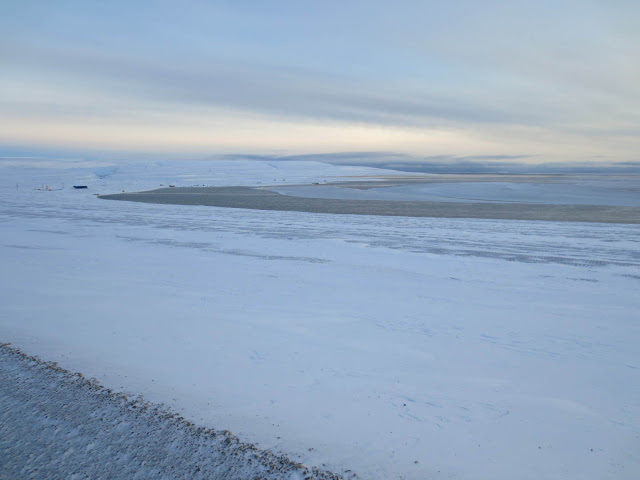 Cryosphere today next day with Winds from the North as with the clearer sky pictures above. Wellington Channel (as per arrow) apparently lost a whole swat of ice without evidence of it going anywhere. It disappeared. Suggesting that it might have been snow cover over a calmer sea channel. Unrealistic as it sounds it was so near the shores of Southern Cornwallis island. All credit to the good people of the European Space Agency who made this; they captured the Arctic Ocean melt minima of September 2012 in February of 2012. In essence the melt minima was made by the Maxima extent ice thickness display. The path of Southern in origin cyclones closely matched the thin ice cover area as well. These cyclones prevented thicker ice from forming. It is the first time I notice this feature. If repeatable, it will be possible to predict the path of Arctic Ocean Navigable waters as early as February, making trans oceanic shipping plans much easier. Low pressure systems biggest tracks are from NE Atlantic and NE Pacific. Same as with foot prints over snow, past cyclone tracks left an imprint of thinner ice. A significant cooling trail has always historically come from Northern Ellesmere and Greenland. There was always an almost constant Low pressure system over Baffin Bay which "pushed" -45 to -50 C colder air over from Ellesmere to Arctic Ocean pack ice in late winter. Over centuries this great freezing area gave the Canadian Archipelago's NW ice shelves and perineal ice covered lakes which are now vanishing quickly along with thick multi-year ice. 2012 cyclones penetrated fortress winter more often in the dead of winter. Their greatest contribution was to warm up areas in total darkness reducing ice accretion. For Arctic Ocean sea ice to vanish totally during a future probable summers melt, the cooling track from Ellesmere must be severely reduced, it has warmed but not enough to weaken extreme consolidation and ice buildup. There is no perineal Glaciers cooling the other regions around the Pole. In the future, the footprint of cyclonic incursions during winter after the long night will be observed at the equinox, and will tell how much the Arctic Ocean has warmed. A strong possibility is the freezing temperature of sea ice. Perhaps misunderstood as caused by -2 C air. Local measurements make sea ice freeze at -1.8 C for surface water and about -11 C for air surface temperatures right above. This phenomenon became a local observation after a discovery from scuba divers venturing at about the North Pole in 2010. The vast majority of the outlines match the -10 to -15 C boundary, it shows without doubt that sea ice freezes significantly (15% extent) with surface temperatures much colder than -2 C. Also Ice onto itself cools sea water and the air immediately above. Fairly good article for a change outside of main stream super accurate Weather Underground and Real Climate reports. Sea ice plays a significant role in the global circulation system. Of which it nearly lost its Polar atmosphere this summer, was it not for the remaining Arctic Ocean sea ice pack and Greenland. Unfortunately for the UK and NW Europe, Greenland will be the Cold Temperature North Pole for many summers to come. 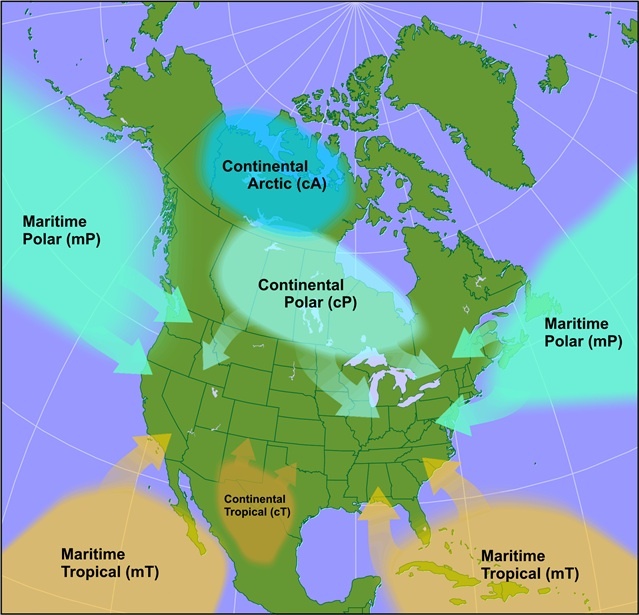 The Cold Temperature North Pole use to vary in location throughout the existing Northern Hemisphere Cryosphere. It was just reduced to a very narrow area between Northern Greenland, Swalbard and a little more towards Russia this past summer. The good part of this; makes great steady weather further to the South, the bad part, if the weather is not pleasant, you may have to endure it for longer periods of time. How to find the Cold Temperature North Pole? Use your favourite model analysis, real time analysis, not the forecast, and look for the 700 mb product, the coldest air at 700 mb (it should be 650 mb) is close to the Cold Temperature North Pole, the centre of the coldest atmosphere in the Northern Hemisphere. 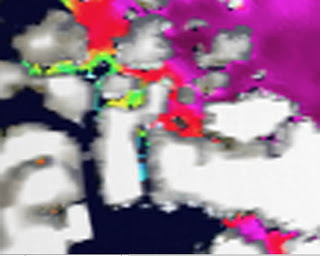 September 17 Polarstern ship in yellow, exactly where the ice is melting very near the Pole, has taken some upper air profiles amongst numerous other scientific on going projects. Only 400 miles apart, the North Pole is much warmer at sea level than high above in altitude, while the icier Northern Ellesmere is opposite. This demonstrates what open water does along with loose pack ice. 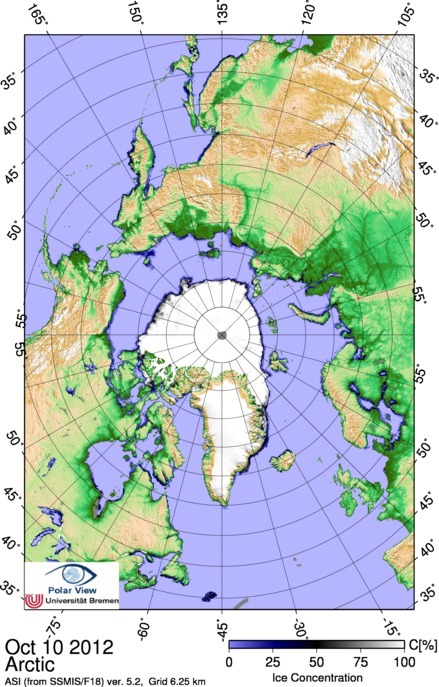 The Pole is experiencing its first big thaw in millions of years in a few geological seconds of the last few years There is likely a strong adiabat at Polarstern location. 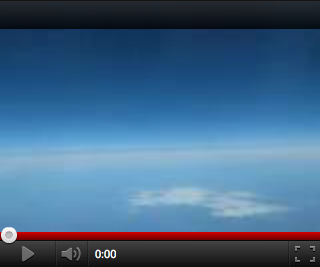 This makes the stratosphere cooler when the surface is warmer. The high speed super computer circled Northern Ellesmere at 250 mb suggesting error of sounding, this was unlikely so as the atmosphere is much different not too far away, North Pole open water expanses versus beginning of freezing consolidating multi-year ice amongst Ellesmere glaciers and Greenland, a true driven contrast from surface features effectively mirrored in the atmospheric circulation above. And determine that this sun disk data is about normal for September in the high Arctic. But average is misleading on account of the great cloud coverage, it should be below average because the sun doesn't have a chance to warm up the surface. In effect despite repeated overcast days the sun disk is average in size all while data provided by satellites give the same result. A rare now a days capture, slightly above average vertical sun disk, despite Resolute being at the cold temperature North Pole. The clouds are now reversing roles, from a net cooling to warming, as sunset is just about to darken the Pole for the long night. You, the readers of this blog, are a witness to great long range forecasts. Its time to boast a little. Often my predictions come through, in this case it was based on the warmest winter in Arctic History as recorded then. Subsequently after 450 or so Arctic sun disk observations this prediction held through. Along with a foreseen wet spring, a very hot summer eventually cleared of clouds for the greater part of lower 50 N latitude habitants of Earth. July 5 Toronto +36.3 C temperature record, all this heat is not surprising, well in advance predicted, heavy rain is now mostly limited to the west Coast of the rockies, as should be, cold air is not a prerequisite for topographic uplift during a heavily seeded atmosphere. July 12, All over Canada heat wave, well foreseen in January and April, can be explained by the lack of temperature contrast with altitude, whereas capping inversions are raised so high that even thunderstorms are having trouble in forming, kinetic energy of a hotter atmosphere ensures lesser condensation as well. Europe is fairing not much better, but rain is mainly limited to the mountainous regions or above 50-55 N. Asia is likewise the same. Heat is so strong that condensation requires very cold air above which is unfortunately too high. The earlier rains of most of June are now gone, we are in for a Planetary wide heat wave, its not summer, but summer on steroids. July 13, the UK being 50 degrees North upwards has been having rain, lots and lots of rain. The forecast reasoning behind this high latitude rain was the resurgence of El-Nino pushing up more CCN twinned with the fact that there is more colder air aloft at 55 N Northwards. I'll have more on this soon. July 20 Big US drought fits perfectly with all time heat records. Comes a time when even with a great deal of moisture hanging in the air cant fall to ground due to higher levels of kinetic energy in a hotter atmosphere. Essentially the circulation South of 45 N is mainly equatorial tropical in nature exacerbating the lack of temperature contrast needed in creating big rain clouds, there is no ocean over the continents, so tropical air over land is not good for rain. July 21, about tornado totals, those who predicted yet another deadly tornado outbreak should have a better understanding as to why 2012 post spring season appears calm. Weather is also a matter of wind shear, one of the factors causing tornadoes. The circulation pattern of the entire polar temperate to tropical interface is moved Northwards 45 N. Therefore the chances for contrarian altitudinal winds are less, also Cumulus clouds Montreal region appear convective vertically, not slanted as of last year. There is less over all wind shear and greater heights of capping inversions making it difficult for Cumulonimbus to form, greater surface heat create a lower upper air to be very warm an impediment for low cloud formations. "It means from now 2012 has exceeded 2010, something not done since 2010, the warmest year in history. 2012 will be top 5 warmest, Arctic ice extent should be all time lowest, even muddled by a potentially stronger El-Nino the Pole will come close to water everywhere around it. North America will continue being hot, but wet till mid july. Summer is the same as winter, but extending itself from the equator, remains to be known where cool will be, aside from more thunderclouds, it looks like a 2010 Russian heatwave will park somewhere. 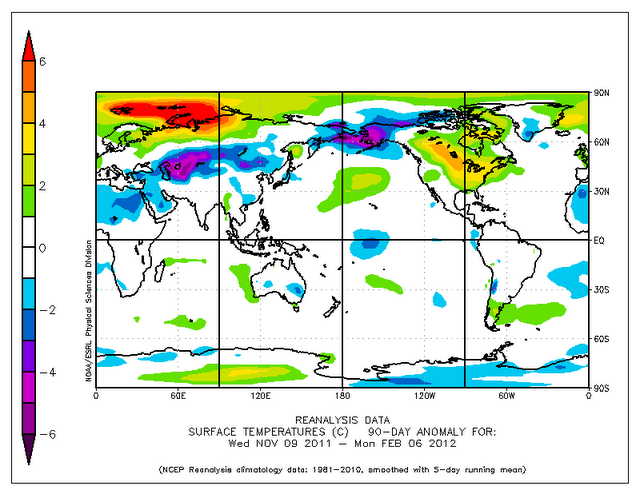 More on this later, observations are not over. . WD April 26 212"
The Russian 2010 like heat wave parked over the US. Not that there wasn't any other heat anomalies elsewhere in the world namely France , Greece, India , China even Maritime Japan . El-Nino hampered the great Melt of 2012 because it gave more arctic clouds, in turn making the AO more positive. Global temperature wise 2012 is about in 5th place to be exceeded at year end, Northern Hemisphere wise 5th place again likely to be exceeded. In short, no predictions failed except for the end of North Americas rainy season. What a great deal of meteorologists don't understand is the importance of Arctic sea ice. Now a days Japan is baking like crazy North of Typhoon zones; The Fire and Disaster Management Agency reported July had the highest number of people taken to hospitals by ambulances for heatstroke ever, more than 21,000 people. Just North lies the most important New ice free Arctic ocean, with no ice in sight to cool things down. El Niño está de vuelta! ~Prediction from CCN observations proved quite good. setting to possibly challenge 2010 as the warmest year in history. To follow by a very warm fall and winter. Cloud wise the higher latitudes 55 N Northwards will be wet all summer, sparing Arctic sea ice the greatest part of the sun's wrath, but record heat will not be kind to it, likely 2007 sea ice extent minima will be beaten. Record heat waves should continue all over the Northern Hemisphere. Rain will subsequently return hard and fast to Lower latitudes come October onwards, the only bright spot seems to be the lack of severe tornadoes, something to study closely. Since end of August I have been almost completely blind from horizon observations. The high Arctic has been very cloudy. This onto itself is a sign of El-Nino, but it can be a CCN lag. 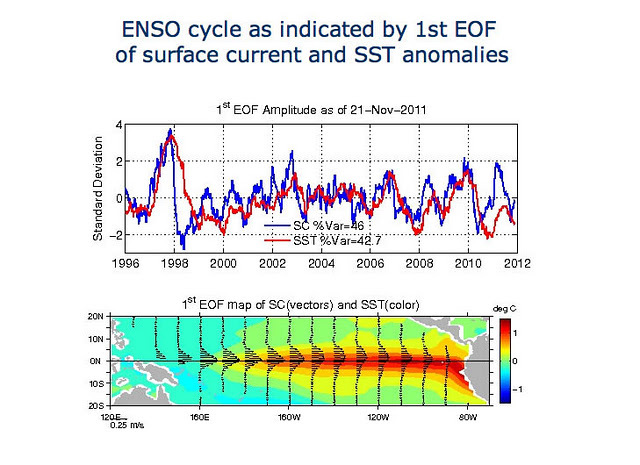 ENSO is difficult to predict like most acknowledged cycles. El-Nino has weakened a tad, but that may be part of an ENSO dance. Remains for me to observe a few horizons before I can judge if the trend is El-Ninowards or towards La-Nina. National Geographic Society famous in many ways, with many good deeds, purveyor of wondrous images, has probably overshot itself in concluding the real reason for Titanic sinking was due to Refraction, there is a small chance that it was so, it requires a refraction computer model. Tim Maltin did some good work, but should have sought further similar effects, not in the US desert, inferior mirages are quite different than superior ones, the documentary misleads a little this way, fortunately superior Mirages in darkness is one of my specialties. In the US, Canada and Europe there are a few very good refraction specialists, best in the world are cited on my main web page introduction. They brought the understanding of atmospheric refraction to a new level of understanding. A superior mirage sun line, the concept of the whole sun collapsed in a line is almost worthy of relativity. So I will explain not the sun, but what is below it. The ice horizon,and closer to bottom, the land horizon. Camera height 47 meters higher than Titanic spotters by 20 meters is important here, the lower the observer the higher a distant object looks like (not was a little lower than Titanic spotters 04-18), but imagine this view from spotters above the bow (the land horizon). If the sea horizon was miraged upwards, a superior mirage, the spotters would have seen whatever is on it. hence the iceberg would have been raised likewise. Now take away the sun, replace it with squashed stars.. The iceberg would not be cloaked. but in front of the miraged horizon richer with compressed star light, the menace would have been very easily visible. Alfred Wegener, one of the great scientists of the 20th century did some ground breaking work with refraction, of which his crowning thought was a blank strip, a cloak indeed, its named after him, there are only a few pictures of them on the world wide web. Essentially a blank strip is a layer of air so long in provenance it is dark, no stars, not even sunlight penetrates it. Above is one of the best known examples, quite devastatingly beautiful, totally strange and mysterious. The mist or haze as described by Titanic spotters may be similar here, its not clouds, its a form of light propagation between layers, the strip is smaller, not the size of a nearby iceberg, but note the ice horizon, still there, an iceberg in front of the suns would be seen, as the ice is (the land horizon is higher than previous picture, the 'bow' is higher here). Given the blank strip equal height to iceberg would make the iceberg far away, starlight from the entire sky would still provide a clue. As a 150 feet Iceberg gets closer to Titanic, say 10 miles away , it would be seen taller than this great strip seen in this picture above. They would have much more time to steer away than the said 35 seconds bells warning, much more than 10 minutes. This is it, with both effects, superior and inferior mirage of an absolutely monstrous iceberg, a good 20 miles away, its bottom inverted and raised. Imagine the stars instead of cloud horizon, the spotter would have picked up the gap in stars and rang the three bells. Iceberg some 10 miles away in front a raised island definitely 20 miles from camera, look to the left of the island it seems stretching out above a gap. It could be a superior mirage of something very far away, no water wall here. Cemented by winter, a single iceberg offers an excellent chance to study. 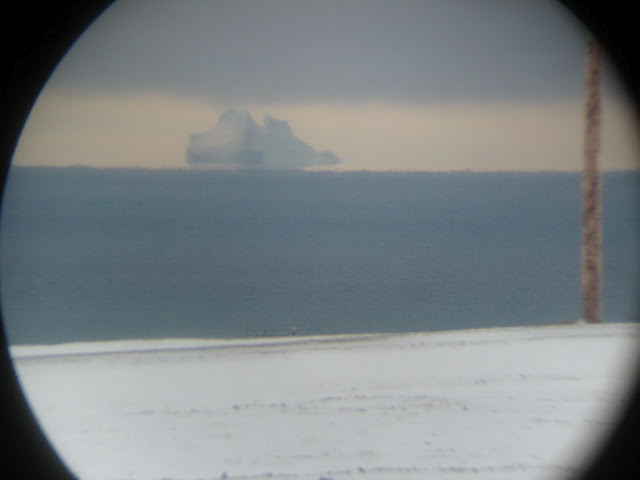 The idea that an iceberg, in this case about 10-20 miles away, would be cloaked, doesn't stand a test of science. 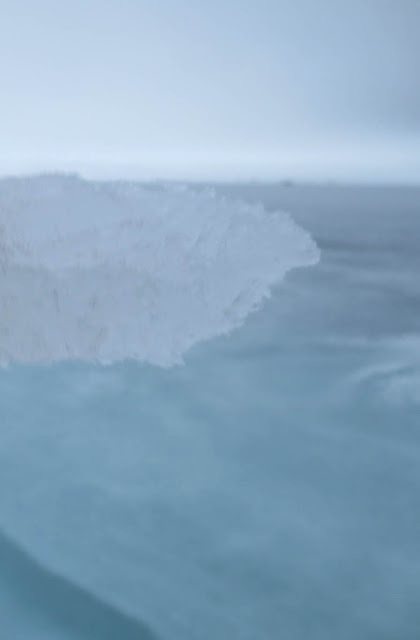 Sea ice walls do exist, they rise from the sea ice horizon dependent on the structure of the upper air having wide temperature differences with altitude which bends light . In this case the iceberg rises with higher wall, may be compressed a little, but is more part of the skyline than the sea itself. What was required by NGS was to find a disappearing iceberg during the day time, great theories need strong evidence. Even so sea water with interspersed pack ice doesn't hold a candle in comparison with extensively thick sea ice refraction. I honor Tim Maltin's theory by closing its chance of being legit, however I leave the door slightly ajar, he was onto something. His theory needs a Wegener blank strip model calculation to prove me wrong, I give him a very slight chance of being right, a water "wall" mirage needs be filmed like this one which should have had a water wall, there is a myst but no wall despite a steep inversion boosting an Island captured from a boat which is telling, I have never seen a water wall, despite all the chances to observe one, I propose that if they exist they could be observable with high precision equipment. If they are observable they must also be common. White Star crew and other trans-Atlantic ships must have known and feared them like the proverbial sea monsters of the famed ancient Greek days. Instead, I suggest light pollution from the Titanic proper giving the tardy response from the spotters, horizon stars cant be seen very well with electric lights about. I believe more likely, Titanic electric light partially blinded the spotters from adequate night sight, they saw the iceberg reflecting the ships light obviously too late. 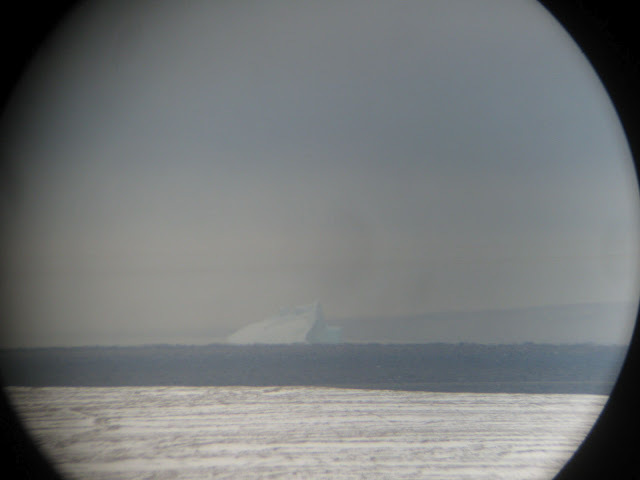 They saw the iceberg 1/4 mile away, really within range of the ships light source. Water walls need be modeled in computers, and also in this case be observed at sea at least once. The idea as proposed by contemporaneous Captains that binoculars were not essential for the spotters is ridiculous. The needed field of vision was strait ahead. I find that point raised during Titanic inquiries a bit suspicious. In fact the guys desperately needed binoculars since they eliminate local light pollution. Or a mounted telescope, any visual aid is better than none. Observing low on the horizon stars requires no light pollution at all. I also think the California was not 10 miles away for its crew to mistake the Titanic as a star. That is not at all possible. 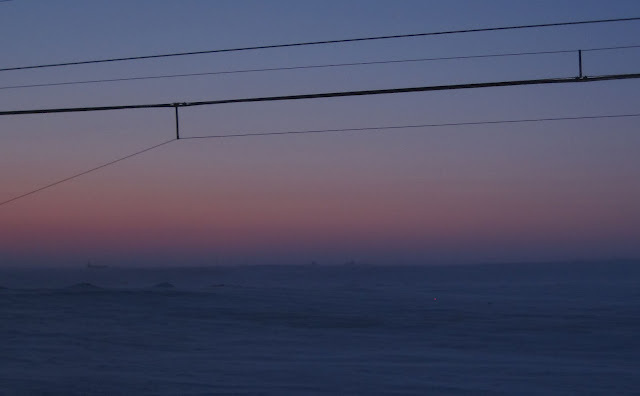 In darkness refraction rich arctic environment, distant lights by 10 miles look like lights 10 miles away. There is some twinkling due to ice crystals but no way resembling any star or planet, I am talking about 300 watt single lights, not an 880 feet ship, but near refraction (10 miles is within near refraction realm), doesn't distort the over all landscape, it just shifts its position. A flashing ship looking like a star happens unlikely over the sea unless by great distance, upwards 30 miles away even more. light carried in streaming thermal ducts. So the California's officers description if I understood well, of Titanic as a star, makes California much further away, rendering light signaling not possible. Hence many years later, it took a long long time to find Titanic because distances and locations were not well known given Navigation technology circa 1912. Lets admit, for the sake of arguing, that Maltin's water wall does happen, make it huge, 20 arc minutes high, towering and impressive does not matter, even if it existed, the dark zone above the water horizon is not a "wall" but a mirage which doesn't cast shadows, they do not mask the star field behind. Its a raised horizon not blocking light, the iceberg even lesser than the wall would still be seen. Finally, which version is it? Did the crews see each others ships, as some testimony seems to contend, or they appeared distant like a star like a cargo ship, as some others contended, were not Titanic emergency flares high enough to suggest distress? 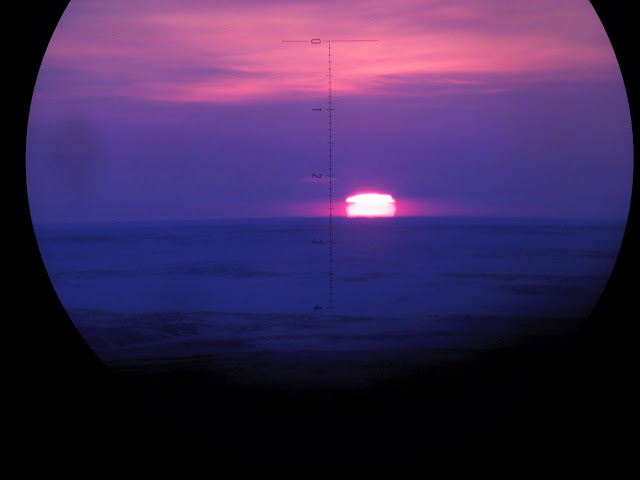 The biggest mirage shown here is 8 minutes of arc high, an iceberg 50 meters high 5 miles away appears 21 arc minutes tall..... Case not quite closed isn't it? 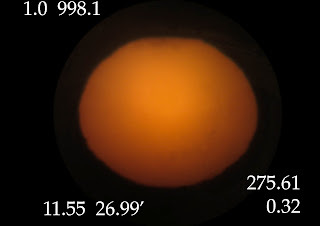 Unless you consider as some will seriously do, a light pollution simulation as seen by spotters above Titanic's deck. The most outstanding data on Titanic Iceberg collision is by the survivors on BBC. Officer of the watch Lightholler: The ship was on high Alert because of Icebergs reported and moonless night conditions. "Immense quantities of ice" was reported. But none of them was on their course, "very vital message" from a ship called Masaba not transferred to bridge crew. "I would have slowed her down" with Masaba message, even suggested Captain Smith would have stopped the ship. After collision, "Masses of ice" fell on fore deck, perhaps the forward deck. Of the Californian, "The ship everyone on board can see" ....."we could see all her lights quite plainly" "all her lights" were seen. Emergency flares went" hundreds of feet into the air" . "The two ships drifted further apart". "The Californian had drifted away". Plainly "Seen the Carpathia" arriving without a mention of a mirage, at daylight. Commander James Boxhall: "having worked the stars out" "20 miles out of a dead reckoning" A sextant or navigation piece reading. Crows nest reported (A light on starboard bow" After reaching the bridge telescope "Two mast head lights of a steamer below the horizon" "very close" , a contradiction, anything below the horizon can only be 20 miles or so away. "We called up the ship with a morse lamp" "eventually this steamer approached and approached until you can see al her lights with naked eye" "you can see her lights in the portholes" . "I didn't see ice whilst in boat" "didn't see the ice until on board Carpathia" , Boxhall didn't see any mirages before being picked up. Californian appeared perhaps at 8 AM. 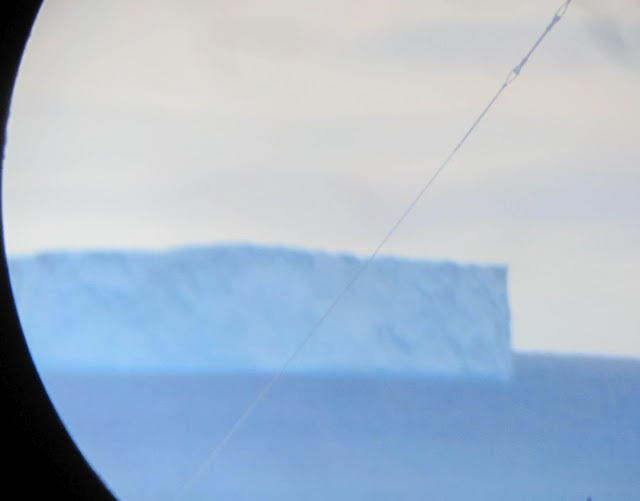 Eva Hart: "The horizon was ringed with icebergs" at first daylight. "They looked like sails" "They were all around us". "why doesn't that other ship come?.... you can see it clearly " About Californian. "A little while after the steamer dived down we caw plainly a fishing boat. We pulled hard to try to get near it, but it faded away in the mist. I think we rowed at least nine miles altogether in trying to reach this fishing boat, and in rowing back to where we believed we should wait for help. Then, suddenly, like a streak of lightning over the edge of the sky shot the searchlight of the Carpathia. I knew we were saved, and I began to look about me. She must have been ten miles away then. I made them keep on rowing, for I knew they might even then freeze before we were reachd. [sic]"
"For the first time we saw where we were. Near us was open water, but on every side was ice. Ice ten feet high was everywhere, and to the right and left and back and front, were icebergs. This sea of ice was forty miles wide, they told me. Imagine some artist able to picture what we saw from that boat at dawn in that field of ice, with the red sun playing on those giant icebergs." A sea of ice explains the mirror calm water. 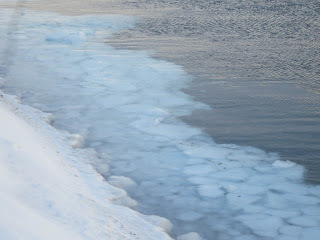 Like trees in a forest, only strong winds can make sea waves on water next to an ice pack. Yes; but before the Titanic sank we were all pulling for a light which we thought was to be a cod banker. We all made for this light. Senator SMITH. You then pulled for that light, and finally discovered you were making no progress toward it? Mr. HICHENS. Yes, sir. Senator SMITH. And you stopped? Mr. HICHENS. We stopped then; yes, sir. Senator SMITH. And at that time you were a mile away from, the Titanic? Mr. HICHENS. Yes, sir; a mile or more, sir. Mr. HICHENS. When the lights were gone out, we were still heading toward this cod banker, all of us. Senator SMITH. That fishing boat was away from the Titanic's position? Mr. HICHENS. Yes, sir, a good ways, sir. Senator SMITH.You were heading for that? Mr. HICHENS. Yes, sir. Mr. HICHENS. I pulled for that light - this imaginary light. We were pulling for it all the time. Senator SMITH. You pulled for this imaginary light? Mr. HICHENS. Yes, sir. Senator SMITH. And never returned to the side of the Titanic? Mr. HICHENS. We could not return, sir. Senator SMITH. you recall whether you found it colder at night than you did in the morning? Mr. HICHENS. Yes, sir; I know the thermometer was down at 31 at 8 o'clock on Sunday evening - 31 1/2. That is the only thing I do remember.Senator SMITH. And both the water and the air were colder when you made the last test - Mr. HICHENS. (interrupting) Yes, sir." "I went on deck and saw the ice falling on us. The berg was about seventy feet high. Our boat itself was seven decks high, and the berg was even with the upper deck. As the berg passed the port-holes it alarmed the women in the berths. After we had rowed three-quarters of a hour towards a certain light, which this fool of ours thought was a vessel, he wanted to know if we thought it was a buoy. Then he called it a fishing smack, but it proved to be the Northern Lights. He was the most stupid man I ever saw. He kept calling out this and that and making incoherent remarks. [sic]"
Major Peuchen makes a great deal of sense... Northern lights are hardly something a Canadian can't recognize. However he doesn't describe these Northern lights. They never are single solitary lights, but often hazy white but never if ever looking like a light bulb. "Referring to that light that you observed, that you said you thought was a hallucination, did that disappear after awhile? Yes; it disappeared; but I did not think, from my knowledge of yachting, that it was a boat light. I think it was one of those reflected lights. The northern lights were very strong that night. It might have been some reflection on ice. I was not satisfied it was the light of a steamer, by any means.- Senator FLETCHER.You could not tell, then, of course, whether it might be a stern light or what sort of a light it might be on a steamer? Maj. PEUCHEN. It was a glare. It was not a distinct light, it was a glare." You did not see this light of which mention has been made until you got into the lifeboat? Mr. FLEET. No, sir. Senator BURTON. What was it? Mr. FLEET. A bright light on the port bow, sir. Senator BURTON. On the port bow? Mr. FLEET. Yes. Senator BURTON. Was it moving, or was it stationary? Mr. FLEET It did not seem to be moving at all. Senator BURTON.Are you sure it was a light? Mr. FLEET. It was a light, all right, because Mr Lighttoller, when I got into the boat made us pull straight for it. Senator BURTON. What did you think it was? Mr. FLEET. It might have been a fisher sail, or something; it was only just one bright light. I could not say what it was.Senator BURTON. You were in the boat with Mr Hichens and this gentleman who was on the stand yesterday? Mr. FLEET. Yes, sir. Senator BURTON. Mr. Hichens thought it was a light on a boat, did he? Mr. FLEET. Yes. Mr. Lightoller made us pull toward it. He seen at as well as us. Senator BURTON. You saw it before you got off the Titanic? Mr. FLEET. Yes, sir. Senator BURTON. What became of that light? Mr. FLEET. We did not know. We pulled for it, but we did not seem to get any nearer to it. Senator BURTON. Did it finally disappear? Mr. FLEET. No. Well, it disappeared by daybreak. Senator BURTON. That is all on that? You did not get any nearer to it? It was not any more visible; that is, any plainer to you; you could not see it any more plainly? Mr. FLEET. No, sir; you could just see the light." " Were you picked up before it was light? - No, it was just dawn. We thought we saw an illumination of a boat coming; it was the Northern Lights." " Two gentlemen passengers got in; the boat was then lowered. When we reached the water we steered for a light in sight, roughly 5 miles. " "Mr. OLLIVER.I saw what I thought was a light; but then I could not say whether is was a proper light or whether it was a star.Senator BURTON.Did you see this before the ship struck?Mr. OLLIVER.No, sir; after we were in the boats.Senator BURTON.What did you think it was?" "Mr. OSMAN.I thought it was a sailing vessel from the banks.Senator BURTON.When did you last have a sight of that light?Mr. OSMAN.About an hour afterwards.Senator BURTON.What do you think about it? Did it sail away?Mr. OSMAN.Yes, sir; she sailed right away.Senator BURTON.You are sure you saw that light?Mr. OSMAN.Yes, sir; quite sure, sir.Senator BURTON.What was it, a stern light?Mr. OSMAN.No, sir; a masthead light.Senator BURTON.Does a sailing ship have a white light on her masthead?Mr. OSMAN.Yes, sir.Senator BURTON.You are sure that light was not a star?Mr. OSMAN.I am sure it was not a star." "We rowed around and tried to get to the other boats, to get close to them. We pulled toward a light, but we did not seem to get any closer to it, until daybreak. A lady back of me complained of the cold, and I took my coat off and gave it to her." "S nator NEWLANDS. Was it 5 miles away, would you think? It was a good distance away; I could not tell you the distance. Senator NEWLANDS. Did it appear to be the light of a ship? Mr. TAYLOR. Yes, sir.Senator NEWLANDS. You could not see the ship? Mr. TAYLOR. No, sir." "We started to pull away in the boat. There was one bright light away on the starboard bow, 2 or 3 miles away, I should judge. Senator NEWLANDS And you rowed for that light? Yes sir. While we were rowing we came on small ice; you could see small ice in the distance." "Yes, her and a little girl. I don't know who she was. I don't know her name. He told me to row for the light, and land the passengers and return to the ship. I pulled for the light, and I found that I could not get near the light, and I stood by for a little while. I wanted to return to the ship, but the ladies were frightened, and I had to carry out the captain's orders and pull for that light; so I did so. I pulled for about two hours, and then it started to get daybreak, and we lost the light; and then all of a sudden we saw the Carpathia coming, and we turned right back and made for the Carpathia. That is all I know, sir." "No, sir. The coxswain of the boat, the master-at-arms, thought it was another ship coming up to give assistance; but after a while the light disappeared." "No, sir; I did not really think of what it was until the firemen and sailors came up and said that it was a boat. Senator BOURNE. That is, a ship? Mr. COLLINS. Yes, sir." "And we fancied we saw a light, sir, and we started to pull toward the light for a time, and then, after we had been pulling for it half an hour, we saw the Carpathia's side lights." - Yes. 10266. Before or after you were lowered into the water? - Before and after. 10267. In which direction?- On the starboard side of the ship. 10268. Bearing how from the ship?- I should take it bearing North. 10269. That would be on the starboard bow? - Yes, on the starboard bow.10270. What were the lights like?- I saw two lights. I took them to be plain, ordinary white lights - two masthead lights. 10271. Masthead lights? - Yes.10272. It looked like a two-masted ship? - Yes. 10273. Could you judge at what distance? - No. Distance on water is very hard to judge. 10274. Could they have been lamp lights in any of your small boats? - No. They would not be that high. 10275. Did you find a lamp in your boat when it was lowered? - No, there was no place to look for any lamp. 10276. Were there lamps in any of the other boats you saw in the water? - Yes. 10277. How many? - I saw three. 10278. Three other boats with lamps in them? - Yes, three other boats with lamps in them, and there may have been more." "10603. As you were one of the last to leave the boat before she sank, I want to ask you this question: Did you observe just at that time the lights of any ship in your vicinity? - I never saw any, Sir. 10604. Or even when you got into the water and on to the raft? - Only the lights of our own boats." "10802. Did you see a light while you were in the boat?- A supposed light do you mean? 10803. Well, I do not know whether it was a supposed light or not. Did you see what you thought was a light? - Yes, we thought there was a ship's stern light. 10804. 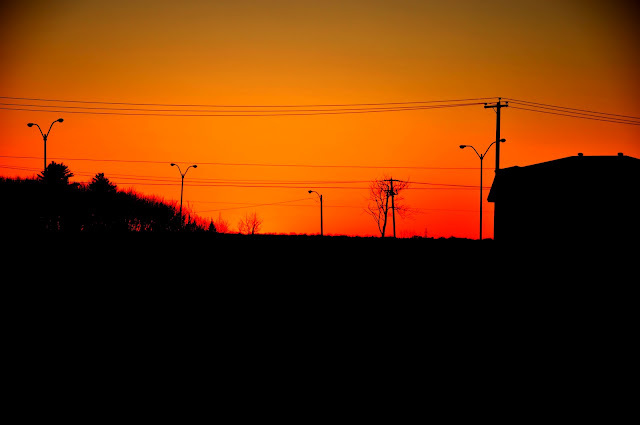 Was it a white light or a coloured light?- It was a reddish light. 10805. And you thought it was the stern light of a ship? - Yes. 10806. Could you say in which direction it was with regard to the "Titanic", whether it was on the port or the starboard side of the "Titanic"?- Well, when I say it was the stern light of a ship, I should suppose she was going the same way as ourselves. 10807. On which side of the "Titanic" was it?- Starboard. 10808. On the starboard side; and you thought it was the stern light of a ship going the same way as yourself in advance of you?- Yes. 10809. And did you row towards that light? - For a matter of about two hours as hard as we could row. 10810. And did you lose sight of it in the end? - Yes." 11072. When your boat No. 1 was lowered into the water did you see any other steamers' lights near? - No. 11073. Nothing at all? - No, I saw a light while I was on board the "Titanic." 11074. Before she was lowered, you mean? - Yes. 11075. What light did you see? - I saw a bright light. 11076. What did you take it to be? - A ship, five or six miles ahead of us. 11077. I think you have told us when the Officer told you to lower away he told you to keep near the ship and come back if called on? - Yes. "13342. (The Commissioner.) Then I do not understand it. I thought you first saw a red light, and then it disappeared, and then you saw a white light? - I saw the red and white, and then the red and white disappeared, and then I saw the white light remain. 13343. You saw both the red and the white light at the same time? - Yes. 13344. And then they both disappeared? - Yes; they both disappeared and left the white light. 13345. (Mr. Butler Aspinall.) That does not do, you see. You saw a red light?- Yes. 13346. And you saw a white light? - Yes. 13347. Did you think at that time that these were the two lights of a steamer? - I did. 13348. (The Commissioner.) About 7 or 8 miles away? - Yes. 13349. (Mr. Butler Aspinall.) After some little interval of time both those lights disappeared according to you? - Yes. 13350. After they disappeared, when next did you see any lights? - It went away, and then I saw the white light about 10 or 15 minutes afterwards again in the same direction. 13351. I think you mean this, do you not, that you assumed that the white light you saw on the later occasion was the white light you had been seeing before? - Or it might have been a stern light." "15385. Which side of the ship? - The port side, I went along the port side, and afterwards I was down the starboard side as well but for how long I cannot remember. I was unlacing covers on the port side myself and I saw a lot of men come along - the watch I presume. They started to screw some out on the afterpart of the port side; I was just going along there and seeing all the men were well established with their work, well under way with it, and I heard someone report a light, a light ahead. I went on the bridge and had a look to see what the light was.15386. Someone reported a light ahead? - Yes; I do not know who reported it. There were quite a lot of men on the bridge at the time.15387. Did you see the light? - Yes, I saw a light.15388. What sort of light was it? - It was two masthead lights of a steamer. But before I saw this light I went to the chart room and worked out the ship's position.15389. Is that the position we have been given already - 41 deg. 46 min. N., 50 deg. 14 min. W? - That is right, but after seeing the men continuing with their work I saw all the Officers were out, and I went into the chart room to work out its position. 15390. Was it after that you saw this light?- It was after that, yes, because I must have been to the marconi office with the position after I saw the light.15391. You took it to the marconi office in order that it might be sent by the wireless operator?- I submitted the position to the Captain first, and he told me to take it to the marconi room.15392. And then you saw this light which you say looked like a masthead light? - Yes, it was two masthead lights of a steamer.15393. Could you see it distinctly with the naked eye?- No, I could see the light with the naked eye, but I could not define what it was, but by the aid of a pair of glasses I found it was the two masthead lights of a vessel, probably about half a point on the port bow, and in the position she would be showing her red if it were visible, but she was too far off then.15394. Could you see how far off she was?- No, I could not see, but I had sent in the meantime for some rockets, and told the Captain I had sent for some rockets, and told him I would send them off, and told him when I saw this light. He said, "Yes, carry on with it." I was sending rockets off and watching this steamer. Between the time of sending the rockets off and watching the steamer approach us I was making myself generally useful round the port side of the deck. 15395. How many rockets did you send up about? - I could not say, between half a dozen and a dozen, I should say, as near as I could tell. 15396. What sort of rockets were they? - The socket distress signal.15397. Can you describe what the effect of those rockets is in the sky; what do they do? - You see a luminous tail behind them and then they explode in the air and burst into stars. 15398. Did you send them up at intervals one at a time? - One at a time, yes.15399. At about what kind of intervals? - Well, probably five minutes; I did not take any times.15400. Did you watch the lights of this steamer while you were sending the rockets up? - Yes. 15401. Did they seem to be stationary? - I was paying most of my attention to this steamer then, and she was approaching us; and then I saw her sidelights. I saw her green light and the red. She was end-on to us. Later I saw her red light. This is all with the aid of a pair of glasses up to now. Afterwards I saw the ship's red light with my naked eye, and the two masthead lights. The only description of the ship that I could give is that she was, or I judged her to be, a four-masted steamer. 15402. Why did you judge that? - By the position of her masthead lights; they were close together. 15403. Did the ship make any sort of answer, as far as you could see, to your rockets? - I did not see it. Some people say she did, and others say she did not. There were a lot of men on the bridge. I had a Quartermaster with me, and the Captain was standing by, at different times, watching this steamer. 15404. Do you mean you heard someone say she was answering your signals? - Yes, I did, and then she got close enough, and I Morsed to her - used our Morse lamp.15405. You began Morsing to her? - Yes. 15406. When people said to you that your signals were being answered, did they say how they were being answered? - I think I heard somebody say that she showed a light. 15407. Do you mean that she would be using a Morse lamp? - Quite probably. 15408. Then you thought she was near enough to Morse her from the "Titanic"? - Yes, I do think so; I think so yet. 15409. (The Commissioner.) What distance did you suppose her to be away? - I judged her to be between 5 and 6 miles when I Morsed to her, and then she turned round - she was turning very, very slowly - until at last I only saw her stern light, and that was just before I went away in the boat. 15410. (Mr. Raymond Asquith.) Did she make any sort of answer to your Morse signals? - I did not see any answer whatever. 15411. Did anyone else, so far as you know, see an answer? - Some people say they saw lights, but I did not. 15412. Did they think they saw them Morsing in answer to your Morse signals; did anyone say that? - They did not say she morsed, but they said she showed a light. Then I got the Quartermaster who was with me to call her up with our lamps, so that I could use the glasses to see if I could see signs of any answer; but I could not see any. 15413. You could not see any with the glasses? - No; and Captain Smith also looked, and he could not see any answer. 15414. He also looked at her through the glasses? 15415. After a time you saw what you took to be the stern light of a ship? - It was the stern light of the ship. 15416. Did you infer from that that the ship was turned round, and was going in the opposite direction? - Yes. 15417. When you first saw her, I understand you to say she was approaching you? - She was approaching us, yes. 15418. For about how long did you signal before it seemed to you that she turned round? - I cannot say; I cannot judge any of the times at all. 15419. Do you know at all whether the "Titanic" was swinging at this time? - No, I do not see how it was possible for the "Titanic" to be swinging after the engines were stopped. I forget when it was I noticed the engines were stopped, but I did notice it; and there was absolutely nothing to cause the "Titanic" to swing. 15420. After sending up those signals for some time did you turn your attention to the boats? - I was sending the rockets up right to the very last minute when I was sent away in the boat." So far all these witnesses in unison , as one person, saw 3 lights one green, one red and the other white, the green may have been confused with Northern lights. Rowing lasted between 30 minutes and 2 hours. But the red light as seen by Mr Wynn makes it likely under ducting light bouncing off the surface and the lower end of the duct. The light was never reached but disappeared with dawn. Also very important its a weak or distant light, they never saw the icebergs surrounding the boats, only when close or heard them. It means they were as a whole, not great observers. Quite understandable, desperate as they may have been, looking for icebergs was the last thing on their minds. These eyes seem to have defined a duct relatively well, a duct is seen differently depending on position. But ducted light lacks one very specific detail. All observers moved, any duct light should seem to twinkle, or flash, like a quasar star. The flashing has something to do with winds, gravity winds, like sea waves, at one moment the light should appear very bright, at the other faint or gone. Northern lights was a misnomer, Aurora or Californian lights under a duct was more likely. The lifeboat descriptions do not define a duct, but concentrated light very far away mostly white rarely green or red. The image of Californian was well seen higher up while on Titanic, with observers looking from within the duct. I would say the glare lights observed by many lifeboats rowers likely was Californian's, upside down lights from its masts, looking like they were from the horizon. I am quite sure that the Californian was less than 20 miles from the Titanic, which the officers report to have been our position. I could not have seen her if she had been more than 10 miles distant and I saw her very plainly. Yes; we had, 42º 5' and 49º 10', as having passed two large icebergs. At what time of the day?Mr. LORD.Ten minutes to 11.Senator SMITH.A. m.?Mr. LORD.P. m.Senator SMITH.That is ship's time?Mr. LORD.At the ship's time for 47º 25' longitude.Senator BURTON.That was of longitude 47º 25' west?Senator SMITH.Do you know the Titanic's position on the sea when she sank?Mr. LORD.I know the position given to me by the Virginian as the position where she struck an iceberg, 41º 56' and 50º 14'. Six o'clock, proceeded slow, pushing through the thick ice. I will read this from the log book. Six o'clock, proceeded slow, pushing through the thick ice. 6.30, clear of thickest of ice; proceeded full speed, pushing the ice. 8.30, stopped close to steamship Carpathia. Is it customary to record the temperature of the air and water in the log?Mr. LORD. Not in our log book.Senator SMITH. Can you give it to me from memory?Mr. LORD.Yes. Senator SMITH. Please do so.Mr. LORD. At half past 10 it was 27 - the water at night; the air was 30. Mr. LORD.We have the officer on the bridge, who can see as far at night as in the daytime. Senator SMITH. But the officer on the bridge could not see the Titanic even with glasses, you said, that night. Mr. LORD. No. So, then, I gave him instructions to let the Titanic know. I said, "This is not the Titanic; there is no doubt about it." She came and lay at half-past 11, alongside of us until, I suppose, a quarter past, within 4 miles of us. We could see everything on her quite distinctly, see her lights. We signaled her, at half-past 11, with the Morse lamp. She did not take the slightest notice of it. That was between half-past 11 and 20 minutes to 12. We signaled her again at 10 minutes past 12, half-past 12, a quarter to 1 o'clock. We have a very powerful Morse lamp. I suppose you can see that about 10 miles, and she was about 4 miles off, and she did not take the slightest notice of it. When the second officer came on the bridge, at 12 o'clock ,or 10 minutes past 12, I told him to watch that steamer, which was stopped, and I pointed out the ice to him; told him we were surrounded by ice; to watch the steamer that she did not get any closer to her. At 20 minutes to 1 I whistled up the speaking tube and asked him if she was getting any nearer. He said, "No; she is not taking any notice of us." So, I said "I will go and lie down a bit." At a quarter past he said, "I think she has fired a rocket." He said, "She did not answer the Morse lamp and she has commenced to go away from us." I said, "Call her up and let me know at once what her name is. So, he put the whistle back, and, apparently, he was calling. I could hear him ticking over my head. Then l went to sleep. Could you have seen rockets? Mr. LORD. I do not think so. Nineteen and a half miles is a long ways. It would have been way down on the horizon. It might have been mistaken for a shooting star or anything at all." “When was it that you saw any ship's light round you first? - About twenty minutes past twelve.7425. What was the light that you saw? - A white masthead light and a red sidelight.7426. Could you see both those lights clearly? - I could see the red light with the glasses.7440. Did you form any view as to how far away the ship was? - From four to seven miles.7440a. You thought she was from four to seven miles away? - Yes.7441. Did you notice anything about her masthead light, her white light? - Yes.7442. What was it? - It was flickering.7443. Did you form an opinion about it; what did you think she was doing? - I thought it was a Morse light calling us up.7444. That would be using her masthead light to send Morse signals? - I did not know it was the masthead light then.7445. Using a light to send Morse signals? - Yes.7446. Did you report this? - I went to the keyboard and called it up. I went to our keyboard and called her up.7447. Is the keyboard that you speak of the keyboard, that would work your Morse signaling? - Yes, Sir.7448. When you work your Morse signaling with your keyboard, what is the light that you flash? - On top of the bridge.7449. Do you know how to use the keyboard and send Morse signals? - Yes.7450. So that you went to your keyboard to send them? - Yes.7451. When you tried to call up this steamer with your Morse signals, could you get into communication with her? - No, Sir; the lights were still flickering.7452. Could you read at all the message, if it was a message, which this flickering light was sending? - Yes, Sir 7453. You could? - Yes.7454. What was it you read? - I did not read any message.7455. Could you read it if it was clear? - I could have done if it was a Morse light, but I looked at her through the glasses afterwards, and found it was a masthead light.7456. Then the light went on flickering, did it? - Yes.7457. And did you look at it then through glasses? - Yes.7458. And when you did that you say you made out that it was a masthead light? - Yes.7459. And did you come to the conclusion that she was not sending any Morse messages at all? - Yes. 7502. When you got your glasses on the vessel and saw the first rocket going up through them, could you make out the vessel at all? - No, Sir, just her lights.7503. (The Commissioner.) Still this glare of light? - Yes.7504. Did that indicate, that glare of light, that this was a passenger steamer? - No, Sir.Did any of the boats of the "Titanic" fire Roman candles?7594. (The Solicitor-General.) Yes, my Lord, Roman candles. (To the Witness.) If it was twenty minutes to four it was not very far off the beginning of dawn, was it? - No, dawn was just breaking.7595. Had it got any lighter? - Yes.7596. Could you see when you saw this flash at all how far away you thought it was? - It was right on the horizon.7597. What sort of a light was it? You called it a rocket? Was it a flash; did you see it go up into the sky? - Yes.7598. What colour was it? - White.7599. And you called Mr. Stone's attention to it, did you, and then there were two more seen? - Yes.7602. When you saw these three further lights did you get your glasses on to the place? - Yes7603. Could you see any sign of a ship? - No.7604. No sign of a masthead light? - No.7605. No sign of a sidelight? - No 7606. Nothing except these flashes? - That is all. 7607. Is that right? - Yes.7608. Then I think you went off your watch at four o'clock? Without a question James Gibson was seeing Titanic through a duct, equally interesting was Carpathia flares at about 4 in the morning , “It was right on the horizon”. A distinction, explained by the fact that Carpathia’s was over water while Titanic was at the edge of the ice field at the beginning of the duct. The glared Titanic lights were the result of compression, or duct tunneling. Judged 4 to 7 miles away was again an illusion proven by lifeboat rowers. "7930. I suppose, at any rate, now you have not any doubt but that that ship which was showing you the navigation lights was the ship which was showing you these series of rockets?- Except, as I say, that they were very low; they did not appear to go high enough to me. 8096. You said there was a steamer heading the same way as you were. How many funnels or masts had the steamer which you saw the next morning? - I could not see anything about her, except her two masthead lights." "8124. When you came on watch at 8 o'clock was it clear? - Yes, quite clear.8125. Could you see the horizon? - No, you could not see where the horizon in the sky finished but you could see stars right down as far as the sea.8126. According to your judgment was there anything in the shape of a haze? - No, nothing whatsoever.8127. None?- None. 8128. Was the captain on the bridge? - Yes. 8170. (Mr. Rowlatt.) What did you say to him? (At about 11 PM)- I knocked at his door and told him there was a steamer approaching us coming up on the starboard quarter.8171. (The Commissioner.) The door of what? - The door of the chart room. It is a Venetian door.8172. (Mr. Rowlatt.) Did you say what sort of a steamer you thought she was?- Captain Lord said to me, "Can you make anything out of her lights?" I said, "Yes, she is evidently a passenger steamer coming up on us."8173. (The Commissioner.) "Could you make anything out of her lights? "- Yes.8174. "I said, 'She is evidently a passenger steamer'"? - Yes, my Lord.8175. You added something to that answer? - "Coming up on the starboard quarter."8176. (Mr. Rowlatt.) Did you say why you thought she was a passenger steamer?- Yes. I told him that I could see her deck lights and that made me pass the remark that she was evidently a passenger steamer.8189. Did you afterwards? - Well, what I took to be a reply. I saw what I took to be a light answering, and then I sent the word "What?" meaning to ask what ship she was. When I sent "What?" his light was flickering. I took up the glasses again and I came to the conclusion it could not have been a Morse lamp.8190. (The Commissioner.) Is the long and short of it this, that you did not get a reply, in your opinion? - In my opinion, no.8191. You thought at first you had? - Yes, I thought at first I had.8192. But you satisfied yourself that you were wrong? - That is so.8193. (Mr. Rowlatt.) Did you go down again to the captain? - No, he came to the bridge.8194. Was there anyone else there except you and he? - Not on the bridge.8195. Did you tell the captain about the Morsing? - Yes.8196. What did he say?- He saw a light flickering himself, and he passed the remark to me. He said, "She is answering you." This was just before I sent the word "What?"8197. After that was done, did you have any more conversation with the captain about the steamer? - When he came up on the bridge he said to me, "That does not look like a passenger steamer." I said, "It is, Sir. When she stopped her lights seemed to go out, and I suppose they have been put out for the night."8198. (The Commissioner.) You said, "It is"?8223. I want to ask you a question. Supposing the steamer whose lights you saw turned two points to port at 11.40, would that account to you for her lights ceasing to be visible to you? I do not know whether that would cause a large number of lights to go out. They had a supplemental dynamo.Mr. Rowlatt:I think the only evidence about lights going out was that at some time after this the lights in a particular stokehold went out for a short time. 8436. If the "Titanic" was in latitude 41° 33', which is the position she has given, and the position in which the wreckage was found, and your vessel was, as stated in the log, in latitude 42° 5', the "Titanic" would be some 33 miles to the southward of the position where you were lying stopped? - If she stopped in 41° 33' and we were in 42° 5.' 8437. Yes? - Yes, about 30 miles. 8438. And if the "Titanic" was 30 miles to the southward of the position where you were stopped, I do not suppose you could see any navigation lights at that distance? Ducts not only have the peculiar aspect of carrying light apparently unstable, flashing, but ducts also are extremely positional, so at 11:40 pm the passenger liner lights appeared off, while in fact the position of Californian and Titanic changed, the duct either rose or descended, or simply vanished. Like a light switch, you see something, then when switched off you see nothing. The very reason for the duct was the ice field, all while there was none between the iceberg and Titanic, because Titanic was steaming over open water until hit first by unfortunately a large iceberg. When at 11:40 Titanic lights were seen extinguished highly likely because there was more water between Californian and Titanic,Lightholler said ""The two ships drifted further apart". "The Californian had drifted away".while on board Titanic close to the same time, it was the only moment when Captain Lord should have steamed full blast towards Titanic. The way to prove this is to use Carpathia sightings steaming towards Californian and Titanic lifeboats, none of survivors, Californian or Carpathia crews cited mirages, right at the time of maximum refraction effects, at dawn. The calculation of Californian 30 miles away cited here just above was nearly accurate, because it took about 2 hours and a half for Californian to reach Titanic remnants. Instead of 5 miles distant from each other, Titanic and Californian were 20 to 30 miles away. The lights carried by the duct through very clear air created a mirage, a mirage of Titanic so close, and the image of nearby rescue as seen from Titanic. This atmospheric illusion doesn't absolve Californians Captain from incredible neglect, carelessness, the white flares tails with "starlights" were also carried by the duct, a gift to his crew to act quickly from a message from afar. A modern equivalent would be watching Titanic in distress through a very bad TV screen image, the image is still seen, the mind must compensate for the bad image. The absence of fast reaction to what was apparently a ship in need of help was tempered by the ice surrounding Californian, but this very ice exclaimed quite loudly that any ship could have been in great distress. Why Evans wasn't awaken to communicate by radio waves was simply unexplainable by no other reasons except Lord's lack of curiosity and ability for making quick life saving decisions, he wasn't a good Captain for ships other than his own. Perhaps in terms of navigation of the day, when search and rescue was done mainly by private steamers, he was not the best Captain around. 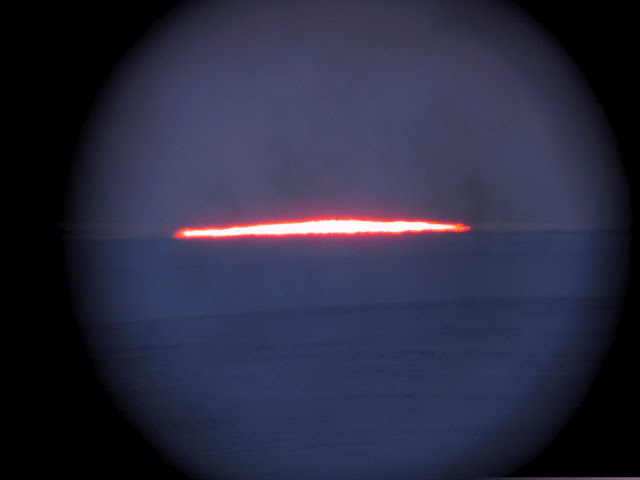 Here the CCN's in Resolute are unmistakable, 10 degrees high, preceding another wave of Equatorial Pacific warming, but there was also a silver lining seen way above the sun aureole after sunset. The high Cirrus in Montreal had exactly the same color as the silver lining captured in the high Arctic. The Resolute silver lining was likely a PSC . Again EH2r April prediction was bang on, remains to be seen if the diluvial days will morph into much drier interspersed with occasionally violent thunderstorm events from end of June till October. The wet episodes will migrate northwards leaving a hot summer for below 50 degrees North inhabitants. The string of EH2r successful predictions is very exciting, and is not matched anywhere in the world thanks to correct sky observations. How important is Stratospheric Ozone vs Severe weather? 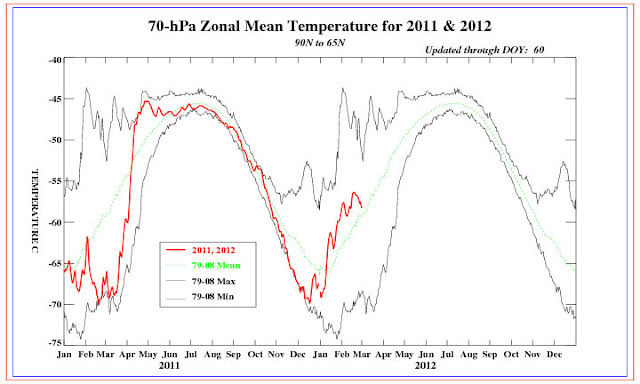 Another great NOAA graph, plainly shows the stratosphere of late winter 2011 sharply unlike 2012. NOAA SBUV/2 last year (left) and feb 29 212, clearly demonstrate much more ozone which is a greenhouse gas, when present the stratosphere gets much warmer. So far at this time there was less than 1/2 the number of tornadoes compared to last year. Yet all the precursors and warnings were about a repeat of Spring 2011. This did not happen, happily for the good folks in Tornado zones. Stratospheric ozone does matter it seems. But not only because it cools the upper atmosphere. But because it literally transforms the physics and dynamics of its winds. From an early disappearance of the Polar stratospheric vortex (2012) to a very strong extended stay (2011 and 1997) of its presence affecting the entire Polar streaming of winds much further below. The cold stratospheric air at lower latitudes combined with all time warm temperature records wasn't enough to trigger massive 2011 like tornadoes, very strong wind shear was needed, for this to occur the Stratospheric Vortex must be huge, invasive and influential in introducing chaos. Many more observations and studies past and future, must likewise confirm this Spring time link. 350 observations, 120 decimal levels from -1 to 10 degrees elevation. 433 observations FINAL: 2010 17%, 2005 15%, 2011 14%, 2012 and 2006 13%. 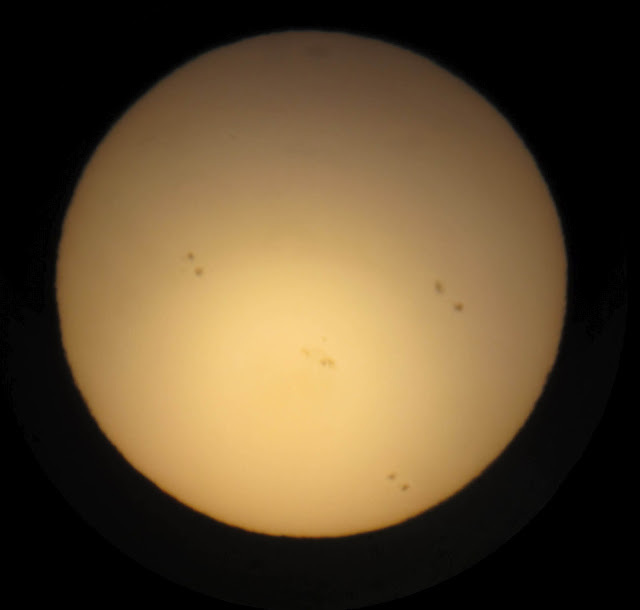 I usually always rely on the no later than Mid April observations because they are based on a more surface based spectrum of elevations, starting May onwards, the lower sun disk observations become progressively scarcer as the sun rises in the sky. So the Upper Air predominates, from 3 degrees elevation upwards. On May 1 the lowest observation was 3.98 degrees, On May 12 the lowest was 7.78 degrees. The entire lower atmosphere was not so dominant in these measurements. Therefore the later May additional comprises of a more Upper Air driven indicator. This does not change the long term outlook as given above except that it should mean more rain. As it has happened and was projected more because the resurgence of El-Nino. The sunset streaks gradually, got higher daily from 2, 4, 6 and now 10 degrees. Seems El-Nino is trending. Usually El-Nino builds during summer peaking by December. It looks like a big El-Nino is forming, but last year it switched by August. Regardless, spring El-Nino seems already here. I celebrate another good prediction, beating most models. The power of the eye and mind is still impressive. Courtesy DMI March 30 2012, North Ellesmere and Greenland. 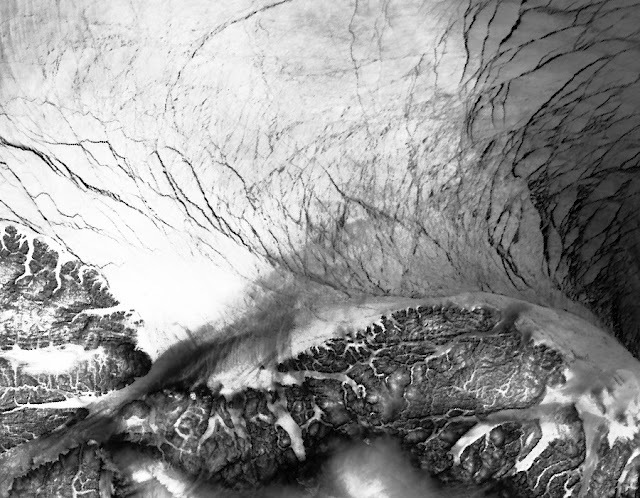 Leads North of Ellesmere of the likes usually in the NorthEast of Greenland, where ice meets the North Atlantic. 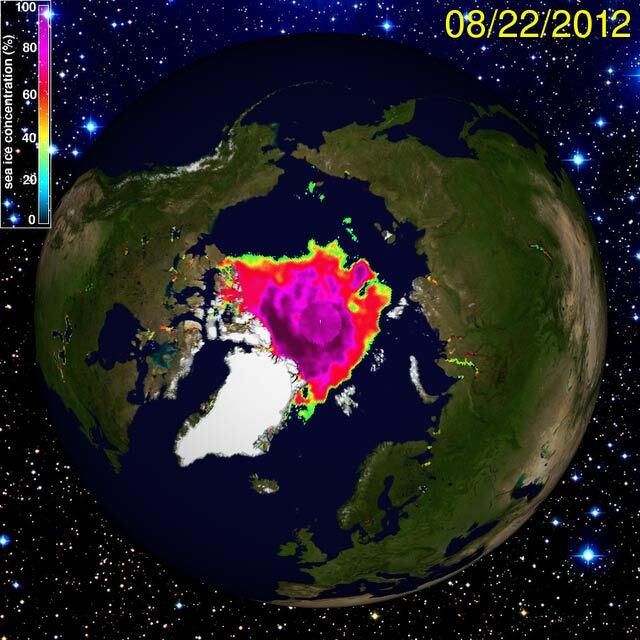 Even if ice extent appears highest in 3 years at the peak season, this picture says it all. 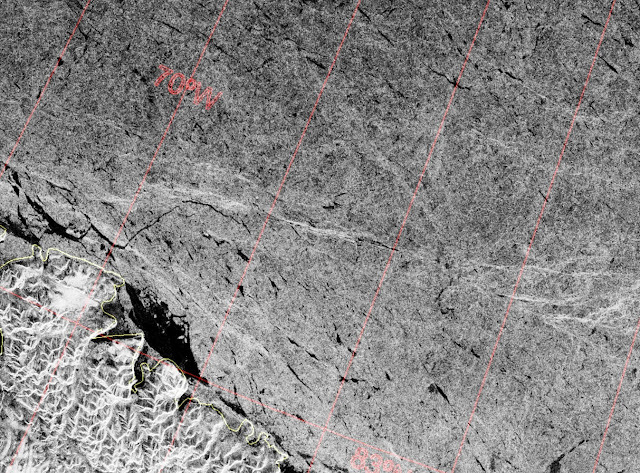 The lack of steady ice shelf between Ellesmere and Greenland gives this appearance, in the past ice was much more solid. Winds from the South are largely responsible for this amazing new look. WD March 30 2012. A Major league North American heat wave has hit ever so winter weary people with great pleasance. The standard way of explaining this phenomena is insufficient, it does not describe molecular or quantum level factors, progs rather deal with synoptic scale patterns and overall pictures, chaos theory nearly forbids the recurrence of exactly the same meso formations giving identical events. Standard met analysis methods fail to include several newly found indicators which are crucial to have a good idea of what is coming. Hence the unpredictability of long range forecasts are presented by major meteorological outfits wearily or overconfidently attempting 3 to 6 month projections having no more a chance of happening any better than flipping a coin. Yet the very warm and wet winter of 2011-12 was projected by yours lonesome by using most basic principles at an extreme level. First and foremost met organizations not recognizing Anthropogenic Global Warming are doomed to fail, trace gases like Ozone . Methane and CO2 have a significant impact over climate, playing an overall major influence over weather. Forecasters laughing at or neglecting trace gases have usually very poor projection records, they assemble media gravitas by creating an illusion of success. Regardless of a record proving so they have a following similar to a cult, making projections regularly. However, being somewhat correct irregularly is meaningless. James Hansen and al at NASA predicted the current warming phase of the entire planet during the 1980’s because they incorporated the best knowledge possible in computer models. This is a major achievement in science which should be recognized, those who fail to accept a successful model predicting trends correctly are equally bound to fail. I predicted the winter of 2011-12 correctly because I also live in the Arctic, there are incredible changes here. No doubt so strong climate transformations elsewhere would automatically raise significant concerns. 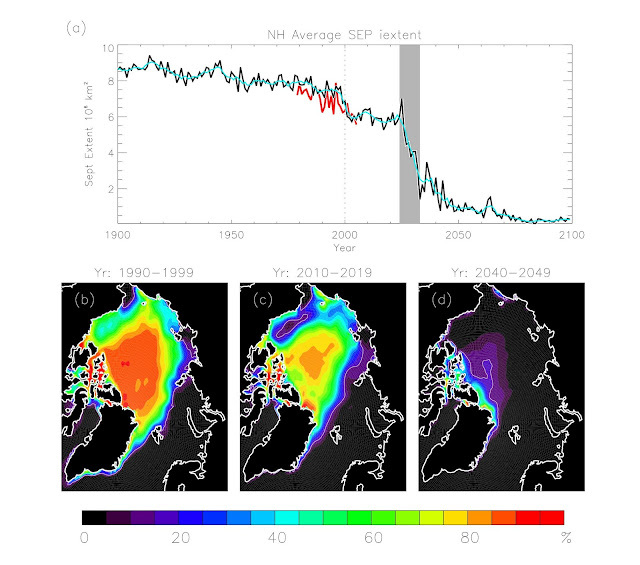 The Arctic hugely impacts Northern Hemisphere winters, but its ice volume is shrinking rapidly, Arctic Ocean melt of 2011 was very significant, in its wake at winter onset was thinner saltier first year sea ice on a huge scale. This ice alone causes major changes. Again neglecting the Arctic is at the peril of every organization trying to come up with an accurate long range forecast. Having a special new way of measuring the overall temperature of the atmosphere instantly helps a great deal as well. The refraction method captures the very nature of the atmosphere. 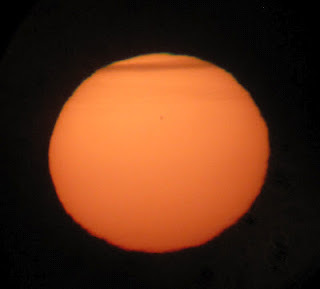 Winter has boundary layers (smaller vertical sun disks) summer doesn’t (nice round sunsets same like in the tropics). Sun disk observations haven’t showed any significant winter trends, to the contrary they follow and confirm the temperature record quite well, and likely demonstrate the temperature records being conservative on the cooler side. As I write , the very reason for the jet stream undulating further North, as written by Doctor Masters is because the entire Arctic was and is warmer. The latest spell as of March 15 2012 record warm temperatures in North America are due to a migration of the cold temperature North Pole oscillating well over Northern Siberia, until recently. And so the Arctic has company in wonderment, Global Warming kills winters, would it be possible any other way? ~ Where will near future cold air form? The very mild North American winter of 2012, one of the warmest ever, was not entirely felt the same way on the other side of Earth. Europe went through extreme conditions very much like what was seen in North America late winter of 2010-2011. Eurasia so big and vast, the largest land mass on our planet is bound to get cold during the low noon suns. Siberia, the very word, means deep freezing to most, it generates winters like no other. The larger question is why its not coldest? Why it didn't spawn 2 mile high glaciers during the ice ages? Veiled in deep mysteries but not hiding its coldness, the larger question is answered by greater massive Eastward circulations, the great whirlpool North of the Polar jet stream, but when the eddies turn in unfamiliar ways, Siberia spills Westwards. The Arctic is no longer the winter generator it used to be, so when Siberia sun rays are so low, cold migrates Northwards as well, this affects the entire circulation system, which still turns Eastwards but gets omega blocks stopping the Pacific warming interface machine in its tracks. The Norther Pacific then warms anomalously, I can go on but everything gets changed when a cold place like the Arctic becomes warmer. This concept is gathering steam, I have been long preaching this from the Arctic moisture desert, alas many a times has the Arctic been ignored. I like this April 2 synopsis by Dr Masters, however most of the papers cited seem to suggest that winters will be deformed by Anti-cyclone blocks favoring a cold or warm side. 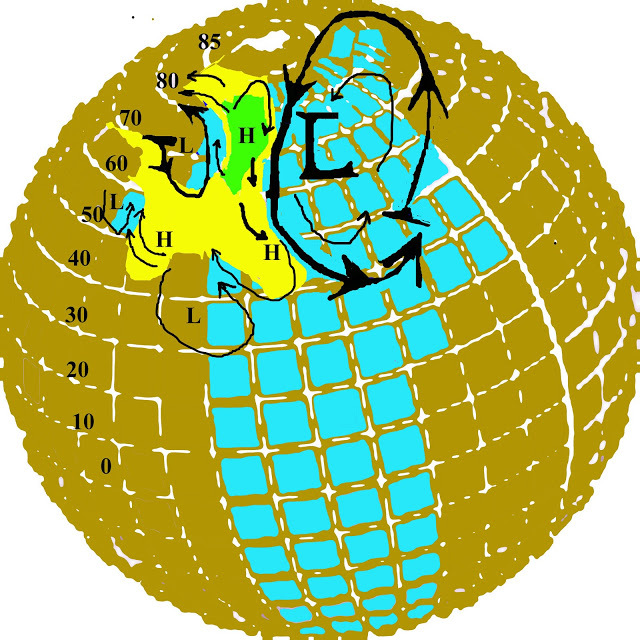 It is so in a way, but they miss the larger image, winter spans a far lesser extent, it turns the way of the Earth, like a top with tops on top, swaying to one side or the other of the Pole , always gyrating by perpetual rotation, omega blocks are a simple small top created by others, the bigger one which shrinks in synch with Global Warming is the one to watch. The last "March summer" madness event in North America was caused by the big top moving to the other side of the North Pole towards Russia. The block ridge spanning the length of the rockies was a mere virtual elastic, eventually bringing back what is left of winter to our side. Black horizontal streaks perpendicular to sun rays appear to vary along with ENSO cycles. They are likely sublimated ice crystals, which went upwards with high altitude convective currents. 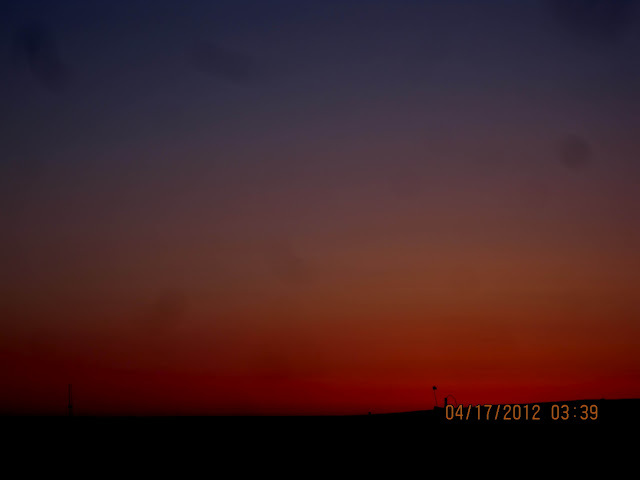 At sunrise these streaks are hardly seen. Condensation Cloud Nuclei should appear more numerous during El-Ninos. Feb 17 shot makes them covering more than double last Octobers Sky. Below is the writings of how I resolved the next El-Nino cycle. It was and is a work of patience, especially since in between cycles tend to either trend one way or another. The natural El-Nino appears usually mid summer onwards, but data seems to indicate it will show signs of appearing mid-spring, now suffices to observe if all the factors allegedly triggering El-Nino make it so, these are 1-low pressure at the Poles, 2- Satellite observed Equatorial Pacific sea surface warming 3- Unusual cloudiness in the Arctic 4- The appearance of high altitude black streaks at sunset. The eyes see them much better than a digital camera. 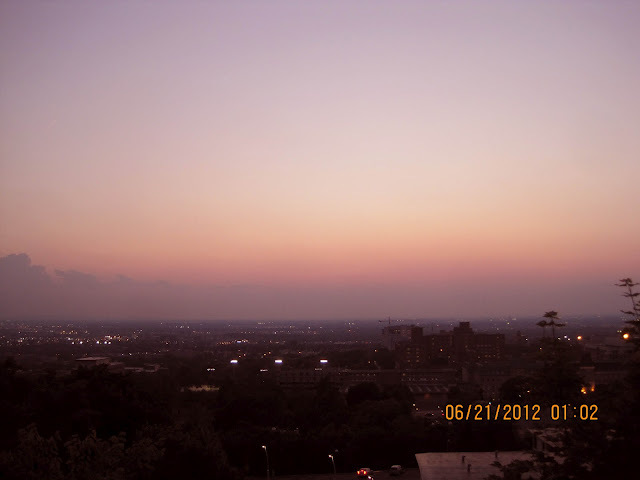 The black streaks, very high quite faint in appearance (left), covering more than 1/4 of the horizon sky, are made obvious (right) by darkening the image. The greatest such show of them in years, it is sort of like El-Nino never stopped trending this early summer. The stall written above coincided with the the CCN streaks. ESR trends El-Nino, but Arctic cloud clearing signal unusually late this fall is mirred by the Arctic Ocean emitting more moisture from new ice broken up by millions of leads. I am more convinced El-Nino is coming, but at an odd La-Nina usual time. ESR blue always points the trend direction right. 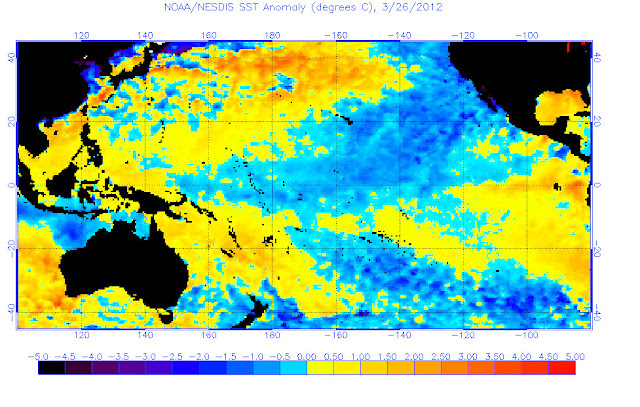 ENSO is not the dominant player, its the Arctic Low centric atmosphere. WOW moment for the real guys studying meteorology .. The lower pressure anomalies at both poles at the same time is an El-Nino trigger, usually El-Nino gestates during end of spring and summer. Ultimately collapsing at about Christmas. 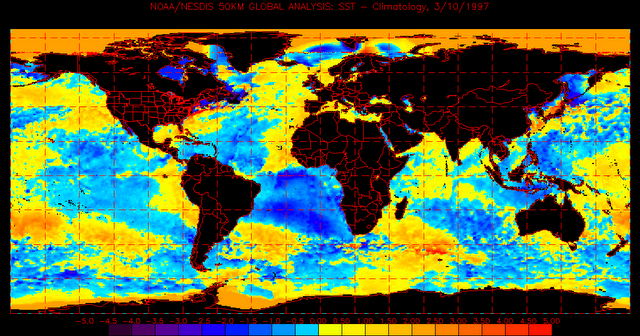 March 10 1997 similarities are really telling, El-Nino is poised for a comeback, only horizon skies can confirm... Its a print when the horizon sky confirms. 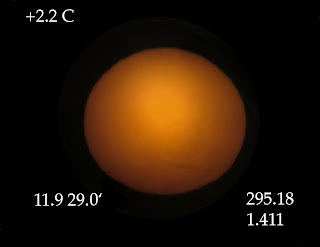 First Sun disk is remarkably expanded, depicting heat as penetrated from the South through a great deal of atmospheres, it also means there is a lack of interfaces, suggesting a more uniform atmosphere. Multiple sundisks have enormous prognostic and forecasting data to mine. Looks like he feels that it will be a colder than normal winter globally and ..... be bitter cold and so is central Canada too for the winter2011/12. 6 Oct 2011  Bitterly cold blasts of arctic air are expected to invade the northern Plains, Midwest ... View full sizeAccuweather.com2011-2012 winter forecast ..."
"Summer 2012 will be the warmest summer ever blasting heat well past 2010"
But I wont, I am bound to work hard and acquire data, to confirm this hunch, such is science, often romanticized as easy, "once with a grant let the students work", sadly I observe completely alone, with very tedious repetitive efforts, demanding, sometimes long hours, laced with doubts, a reasoning sharpening tool. I need an assistant so I can wander in the horizon of the new science to come. Would be nice spending more time prognosticating, like about the coming ENSO seeding, clouds are my main concern, there is not a chance for this coming summer to be cool but only by clouds. I am astounded by the sudden recent warming of our stratosphere, which may be good news for tornado alley people. Then again sunrise photochemistry has just started, showing some signs of high altitude upper air cooling. 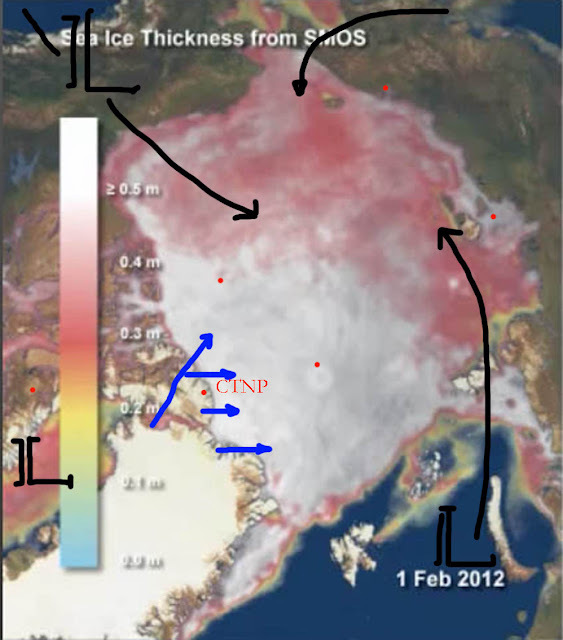 The other big factor is sea ice, now dominated by a completely new world of Arctic Ocean thinner sea ice, it isn't that simple to understand, it is not straightforward, it can give very wicked deviations, for instance less brine is created, I am getting around thinking about this. But for now my relax mode tentative projection rules until I make it official at the beginning of April, armed with data coming directly from the atmosphere thanks to the sun and sigh .... lots of work... . There has been some very interesting weather presentations of late making "Arctic Air" responsible for bitterly cold surface temperatures . Especially from TV presenters who should know better. They call it Arctic blast. arctic cold front, even in the UK they use the same words as in North America, pity. In Chicago USA they call it arctic chill, In Canada they write` "Arctic Air blast Chills Ontario, Quebec", CBC Canada has a new show entitled "Arctic Air", which has more reality than the presentations. Courtesy NOAA 7 day surface temperature anomalies, there are a few cold below normal Arctic spots, while the buildup of winter certainly doesn't come from the Arctic ocean. North winds no longer so cold. The present deep freezing is over the continents, as a switch, the Arctic gets more frozen by what is happening Southwards. 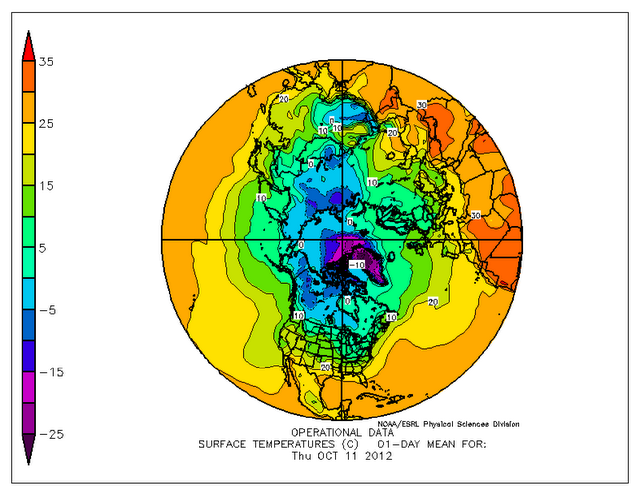 As you can see, its the North American Northwest Sub-Arctic which again has started winter to show itself stronger. The Arctic is cooling just fine but at a much slower rate, temperatures North of the very much cold air is warmer over the Arctic ocean where the flow originates from , no doubt linked with thinner ice laced with multiple leads of open water easing the penetration of Low pressure cyclones from the South. This is a recently new pattern, within the last ten years a yearly event. Not that people even specialists note that the Arctic has been a great player in climate change, perhaps the greatest, easily surpassing ENSO, the North Atlantic Oscillation (which is linked with the AO). Arctic atmosphere transformations affect the entire Northern Hemisphere at once, morphing the not so seen but warped Hadley cells circulation main energy source, the temperature difference dT between the North Pole and the equator. Of which this may explain why ENSO is out of cycle, whereas I would expect La-Nina to start now, but see clear signs of El-Nino gathering a return appearance, because dT is weaker from Pole to equator, the winds generated from the lesser difference loose 'steam pressure', in effect causing equatorial winds to slow, a definite trigger for the Pacific to change sea surface temperatures. A warmer Arctic greatly affects large meso-circulation anti-cyclones and cyclones in a behavior not consistent with La-Nina, neither El-Nino of old, these are the days when the ever so different Arctic changes absolutely everything.